Information in this manual is subject to change without notice and does not represent a commitment on the part of Applied Acoustics Systems DVM Inc. The software described in this manual is furnished under a license agreement. The software may be used only in accordance of the terms of this license agreement. It is against the law to copy this software on any medium except as specifically allowed in the license agreement. No part of this manual may be copied, photocopied, reproduced, translated, distributed or converted to any electronic or machine-readable form in whole or in part without prior written approval of Applied Acoustics Systems DVM Inc. Copyright ©2015 Applied Acoustics Systems DVM Inc. All rights reserved. Printed in Canada. Program Copyright ©2004-2015 Applied Acoustics Systems, Inc. All right reserved. Ultra Analog VA is a Trademark of Applied Acoustics Systems DVM Inc. Windows and Windows Vista are registered trademarks of Microsoft Corporation in the United States and other countries. Mac OS and Audio Units are registered trademarks of Apple Corporation. VST Instruments and ASIO are trademarks of Steinberg Soft Und Hardware GmbH. RTAS and AAX are registered trademarks of Avid Technology Inc. All other product and company names are either trademarks or registered trademarks of their respective owner. Unauthorized copying, renting or lending of the software is strictly prohibited. 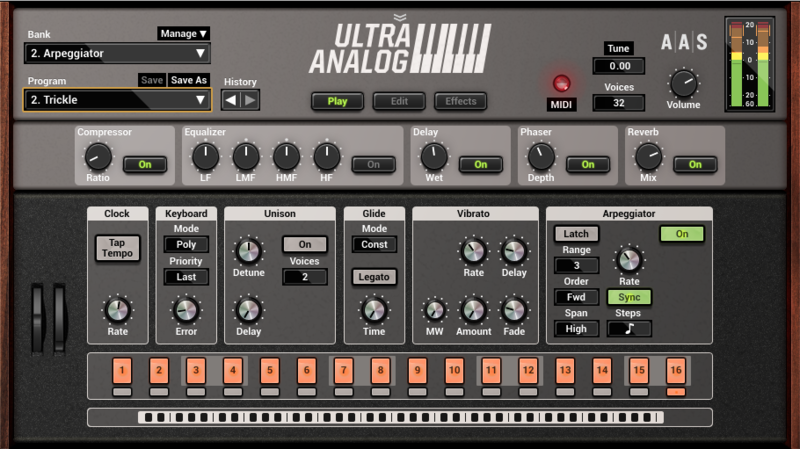 Ultra Analog VA is a virtual analog synthesizer that combines into a modern instrument features of the legendary vintage synthesizers. Ultra Analog VA generates sound by simulating the different components of the synthesizer through physical modeling. This technology uses the laws of physics to reproduce how an object or system produces sound. In the case of Ultra Analog VA, mathematical equations describing how analog circuits function are solved in real-time. 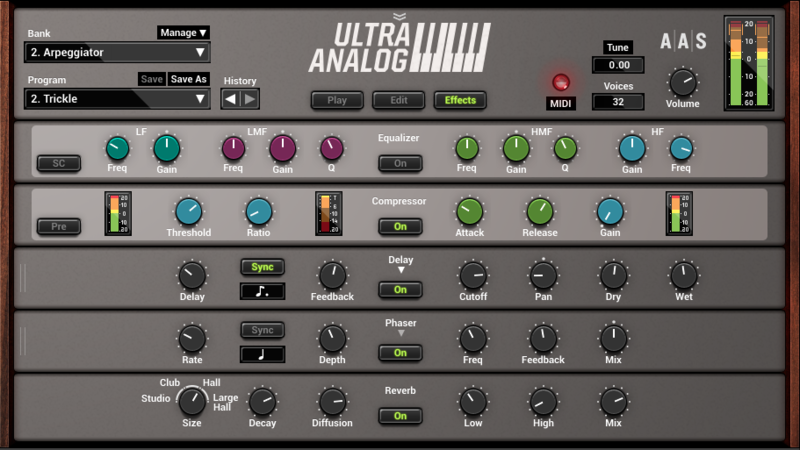 Ultra Analog VA therefore uses no sampling or wavetable, it just calculates the sound as you play in accordance with the controls it receives. This sound synthesis method ensures unmatched sound quality, realism, warmth and playing dynamics. Before discussing the synthesizer in more detail, we would like to take this opportunity to thank you for choosing an AAS product. We sincerely hope that this product will bring you inspiration, pleasure and fulfill your creative needs. Keep in mind that the computational power required by Ultra Analog VA depends on the number of voices of polyphony and the sampling rate used. These computer configurations will enable you to play the factory sounds with a reasonable number of voices but performances will vary depending on your specific computer configuration. Installation and authorization of Ultra Analog VA is quick and easy. For the installation of our different products we use so-called custom installers which include both the program itself and your licence information. Installation and authorization can therefore be carried out automatically in a single step and from a single file when your computer is online. AAS products use a a copy protection system based on a a proprietary challenge/response key exchange and therefore their authorization does not rely on other third party software and/or hardware. In order to start the installation process, simply double-click on the installer file that you have downloaded. This will first install the program and then use the licence information included in the custom installer file to to carry out automatically the challenge/response procedure. Once the installation is completed, you can check your licence information by starting the program and clicking on the chevron icon at the top of the interface. This will open a dialog box in which you should see your serial number and the email address which you used in order to get the installer file. Note that your serial number is also sent to you by email when your custom installer is created. If your computer is offline when running the installer, or if the authorization procedure could not be completed for another reason, the dialog box will will not show your serial number and you will be prompted to authorize the program. In that case, click on the Authorize button and follow the on-screen instructions. Note that it is possible to use the program during 15 days before completing the authorization process. After that period, the program will not function unless it is authorized. Windows - Double-click on the Ultra Analog VA icon located on your desktop or select Ultra Analog VA from the Start > All Programs > menu. Mac OS - Double-click on the Ultra Analog VA icon located in the Applications folder. Before you start exploring the program, take a moment to set up you audio and MIDI configuration as explained below. Audio and MIDI configuration tools are available by clicking on the Audio Setup button located in the lower left corner of the Ultra Analog VA interface. The Audio Setup dialog first allows you to select an audio output device from those available on your computer. Multi-channel interfaces will have their outputs listed as stereo pairs. On Windows, the audio output list is organized by driver type. The device type is first selected from the Audio Device Type drop-down list. If you have ASIO drivers available, these should be selected for optimum performance. The Configure Audio Device button allows you to open the manufacturer’s setup program for your audio interface when available. Once the audio input has been selected, you can then select a sampling rate and a buffer size from those offered by your audio interface. The list of available MIDI inputs appears at the bottom of the dialog. Click on the checkbox corresponding to any of the inputs you wish to use. Ultra Analog VA comes with a wide range of factory programs right out of the box which amounts to a huge range of sounds before you have even turned a single knob. As you would expect, the best way of coming to grips with the possibilities Ultra Analog VA offers is simply to go through the programs one at a time. Ultra Analog VA uses the notions of Banks and Programs to organize and classify sounds. A program or preset is a stored set of parameters corresponding to a given sound. The programs are grouped and organized in banks. The name of the currently loaded bank and program are displayed at the top of the interface. One navigates among the different banks and programs by using the arrows in each of the corresponding boxes or by opening the associated drop-down menu by clicking inside these boxes. Banks and programs are managed using the Bank Manager which is revealed by clicking on the Manage button appearing above the right-top corner of the Bank box. Playing programs and organizing them is pretty straightforward, please refer to Chapter 3 for a complete description of the bank and program management operations. Ultra Analog VA integrates seamlessly into the industry’s most popular multi-track recording and sequencing environments as a virtual instrument plug-in. Ultra Analog VA works as any other plug-in in these environments so we recommend that you refer to your sequencer documentation in case you have problems running Ultra Analog VA as a plug-in. Note that in plug-in mode the audio and MIDI inputs, sampling rate, and buffer size are determined by the host sequencer. Bold characters are used to name modules, commands and menu names. Italic characters are used to name controls on the interface. Windows and Mac OS keyboard shortcuts are written as Windows shortcut/Mac OS shortcut. The general architecture of Ultra Analog VA is presented in Figure 1. The primary sound sources of the synthesizer are two oscillators and a noise generator. These sources are mixed before being sent to two different multi-mode filter modules in series with an amplifier. Figure 1: General signal flow of Ultra Analog VA. This configuration is very flexible because, depending on the type of mixing applied, sources can be treated separately or in combination. For example, when the filters each receive signal from distinct sources, the right and left information from each source is preserved until the very end of the signal path. Sources can therefore be moved and positioned independently in the stereo space using the panning control on each of the amplifiers. On the other hand, combining the sources at the mixer level results in rich and complex tonal structures. The graphical user interface has been organized around three different views as shown in Figures 2, 3 and 4. The first view, called the Play view of the instrument, gives access to different performance parameters as well as to a step sequencer. The second and third views, called the Edit and FX views respectively, are used for in-depth editing of the synthesis and effect parameters. One can switch from one view to the other by using the Play, Edit and FX buttons located in the Utility section at the top of the interface. This section of the interface is common to all the views and includes the bank manager, used to access and manage sounds, as well as general settings and indicators. These tools are described in details in Chapter 3 and Chapter 5 respectively. The lower section of this view includes a master clock, keyboard, unisson, glide, vibrato and arpeggiator modules which will be described in more details in Chapter 4. On the left of these parameters, one finds a pitch bend wheel and a modulation wheel. The modulation wheel is normally used to control the amount of vibrato in the sound but it can also be used to adjust any other parameter through MIDI links which will be described in Chapter 6. Just below is a clickable eight octave ribbon allowing one to play different notes on the range of the piano which can be useful when no MIDI keyboard is connected to the computer. The middle section of this view allows one to turn the effects from the multi-effects module, compression and equalizer on and off and to rapidly adjust their main parameters. Figure 2: The Play view. The Edit view gives access to the synthesis parameters described in details in Chapter 4. The two oscillators modules appear on the left of this view. The middle section includes the two filters and amplifier modules. One can easily switch from one to the other by clicking on the two numbered tabs. The main envelop and LFO parameters are also included in this section for most required adjustments. The right part of this view allows one to view and adjust the complete set of parameters for all synthesis related modules. One can switch from one module to the other using the small tabs on the left of this section. Figure 3: The Edit view. The FX view includes an equalizer, a compressor a multi-effects, and a reverb module. The multi-effects module consists in two effects in series. The effect list includes a delay, distortion, chorus, flanger, phaser, wah Wah, auto wah and a notch filter. The functioning of the effect modules is described in details in Chapter 4. Figure 4: The FX view. 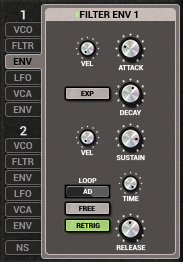 Ultra Analog VA comes with several factory presets, called programs, covering a wide range of sounds. This collection of programs lets you play and familiarize yourself with this effect without having to tweak a single knob. Soon, however, you will be experimenting and creating your own sounds and projects that you will need to archive or exchange with other users. In this section, we review the management of programs. Sounds are stored in banks contaning so-called programs. The name of the currently selected bank is shown in the Bank drop-down display located at the top of the Ultra Analog VA interface. The list of available banks is viewed by clicking on the Bank display. A bank can be selected by navigating in the list of banks using the left and right-pointing arrows in the display or by clicking on its name when the list of banks is open. Clicking on the bank display brings focus on this section of the interface, the display is then outlined by an orange line, and one can then navigate through the list of banks using the up, down, left, or right arrows of the computer keyboard. The list of programs included in the currently selected bank can be viewed by clicking on the Program display located below the Bank display. A program is selected by using the left and right-pointing arrows or by clicking directly on its name. Once a program is selected, the value of the different parameters of the synthesizer are updated and it can then be played. As for the bank list, one can navigate through the program list using the computer arrows after clicking on the Program display. Programs are saved by clicking on the Save button located on the top of the Program display. When a program has just been loaded, this command is greyed and therefore inactive. It is activated as soon as a parameter of the interface is modified. Clicking on this command replaces the stored version of the program with the new one. The Save As command is activated by clicking on the corresponding button which opens the Save Program pop-up window. It is then possible to save the program under a new name or its current one in any of the available program banks. Note that if the original name of the program is used, a new program with the same name will be created at the end of the program list meaning that the original program is not erased. This also implies that it is possible to have many programs with the same name in the same bank. Banks and Programs can be edited using the Bank Manager. The manager window is displayed by clicking on the Manager button located above the Bank display. It is closed by clicking again on the same button. On the left of the window, one finds the list of banks. Clicking on a bank name fills the list of programs located in the center of the window with the name of these included in the selected bank. Figure 5: Bank and program manager window. A new bank can be created by clicking on the + button below the bank list. This opens the Create New Bank window in which the name of the new bank can be entered. A bank can be deleted by first selecting it in the bank list and then clicking on the - button. Be careful, this command erases a bank and all the programs it contains; this operation is permanent and can not be undone. In order to rename a bank, simply click on the Rename button and enter a new name. Banks and the information corresponding to each of its programs is stored in a simple text file on your computer hard disk. In order to view these bank files, click on the Show Files button under the bank list. On Windows, this command will open an Explorer window at the location where the files are stored. On Mac OSX, the command has a similar effect and opens a Finder window. All the bank file names follow the same format and begin with the bank name. These files can be used for backups or to exchange presets with other users. The list of programs included in the selected bank is displayed in the program list in the center of the manager window. Presets are selected by clicking on their name which updates the program information appearing on the right of the preset list. Program information includes the name of the preset, its author and comments. This information can be updated by clicking on the corresponding box which opens an edition window. Note that multiple presets can be updated simultaneously by selecting more than one preset at once and clicking on a preset information box. A multiple selection consisting of adjacent programs is obtained by holding down the Shift key on the computer keyboard and then clicking on the name of the first program to be copied and then the last one. A non-adjacent multiple selection is obtained by holding down the Ctrl/command computer key and clicking on the name of the different programs to be copied. It is also possible to select all programs at once by clicking on the Select All button at the bottom of the program list. Programs can be deleted from a bank by first selecting them and then clicking on the Delete button. This will move the programs to a special bank called Trash which is located below the regular list of banks. This means that deleted programs can always be recuperated as long as they are not deleted from the Trash bank. The content of the Trash bank is viewed by clicking on its name; the different programs can then be moved to the other banks as explained above. The Trash bank can be emptied by clicking on the Empty Trash button which appears below the program list when the Trash bank is selected. Be careful as this command can not be undone. Banks and programs can be changed using MIDI bank and program change commands. For more information on how to use these commands, please refer to sections 6.2.4 and 6.2.5. These files contain all the information corresponding to the programs they include. These files can be displayed directly from Ultra Analog VA by opening the Bank manager and clicking on the Show Files button. This will open an Explorer or Finder window on Windows or Mac OS respectively at the right location. The simplest way to create a backup of banks and programs is to make a copy on an external media of the above mentioned folders. Individual banks can be backed-up by making copies of individual bank files. Banks and programs can easily be shared with other Ultra Analog VA users. This operation simply involves the exchange of the above mentioned user bank files. When a new bank file is copied to the bank folder, it is automatically available to Ultra Analog VA. Note that individual programs can not be exported. They always appear inside a bank file. If you only wish to share a few programs, create a new bank, copy the programs you wish to exchange to this bank and share the corresponding bank file. Restoring the factory library simply involves copying the files contained in these folders and pasting them in the user bank folders listed in Section 3.5. The user bank folders can be opened directly in an Explorer or Finder window, on Windows and Mac OS respectively, or by using the Show Files command directly from the Ultra Analog VA bank manager. Note that if you have bank files with the original factory bank names in your user bank folder, they will be replaced by the original factory files. This means that you will lose programs that you would have modified or created in these banks. This operation must therefore be done with caution and it is recommended that you make copies or rename your user banks before proceeding with the restore. The simplest way to access the bank folder is to use the Show Files button in the Ultra Analog VA-2 bank manager which will open a Finder or Explorer window on Mac OS X or Windows respectively at the right location. The Ultra Analog VA-1 export file will then automatically be converted to an Ultra Analog VA-2 bank having the same name as that of the .axf export file. This new bank will appear along with the other banks in the banks manager and include converted versions of all the programs contained in the .axf export file. Note that the programs will appear in the new bank as a flat list which means that any sub-folder organization within the export file will be lost in the conversion process. While the great majority of programs should be recuperated without noticeable differences, the conversion program is not infallible which means that some programs might need some readjustments after the conversion. This is due to the fact that the mapping of the parameters from Ultra Analog VA-1 to Ultra Analog VA-2 is not direct as a result of changes in the architecture, modules and the effect section between the two versions. This section can be used as a reference for the different controls appearing on the Ultra Analog VA graphical interface. We begin by describing the behavior of the different types of controls appearing on the interface and then describe the parameters of each module of the synthesizer. The synthesizer parameters are adjusted using controls such as knobs, switches and numerical displays. A specific control is selected by clicking on it. A coarse adjustment is obtained by click-holding the parameter and moving the mouse, or the finger on a track pad, either upwards and downwards or leftwards and rightwards. The value of the parameter replaces its label while it is being adjusted. Fine adjustment of a control is obtained by holding down a modifier key of the computer keyboard (Shift, Ctrl, Command or Alt key) while adjusting the parameter. Precise values can also be entered manually by clicking on the parameter label and typing the value on the computer keyboard. Double clicking on a knob brings it back to its default value when available. Switches are turned on or off by clicking on them. They are used to activate or deactivate modules and the sync feature of some parameters. Clicking on a display with a small down-pointing triangle reveals a drop-down menu with a set of possible settings for the control. Adjustment of the control is obtained by clicking on a selection. Different parameters can be modulated by the signal from different sources including the MIDI keyboard, envelope generators and the LFO modules. Modulation signals are controlled with small gain knobs located on the left of the corresponding modulated parameters. The Key modulation knobs are used to modulate a parameter depending on the note played on the keyboard. When in its center position, the value of the corresponding parameter is equal across the whole range of the keyboard. Turning the knob to the left increases the value of the parameter for low notes while decreasing its value for high notes. The variations are applied relative to the middle C (C3, MIDI note 60) whose value is always that corresponding to the settings of the actual parameter knob. Turning the modulation knob to the right has the opposite effect and increases the value of the parameter for high notes while decreasing it for low notes. The Vel modulation knobs are used to modulate the value of a parameter depending on the velocity signal received from the keyboard so that the value of a parameter increases as notes are played harder on the keyboard. The position of the knob is used to adjust the amount of modulation applied to the parameter. In its leftmost position, the modulation source is turned off and the value of the parameter does not vary with the velocity signal from the keyboard. Turning the knob clockwise increases the effect of the modulation signal on the value of the parameter. Modulations using the signal from the LFO and Env modules are controlled using the LFO and Env gain knobs respectively. The amplitude of the modulation is zero when the knob is centered. It is increased by moving it from its middle position clockwise or anti-clockwise. When turning it anti-clockwise, the phase of the modulating signal is inverted while it is preserved when moving it clockwise. The rate of the Arpeggiator, LFO and certain effect modules can be synchronized to the clock of a host sequencer when the program in used in plug-in mode. To do so, simply turn on their Sync switch. Synchronization values are adjusted with the Sync Rate parameter and range from 4 whole notes (16 quarter notes) to a thirty-second note (1/8 of a quarter note) where the duration of the whole note is determined by the host sequencer clock. The effect can also be synced to a triplet or dotted note. To adjust this parameter, click on the Sync Rate button and choose a rate value from the drop-down menu. In standalone mode, when the Sync switch of an effect of module is switched on, the duration of a whole note is adjusted using the Rate control of the Clock module on the Play view. The Edit view is activated by clicking on the Edit button in the top part of the interface. It allows one to go ’under the hood’ and tweak the core synthesis modules of Ultra Analog VA and therefore to customize its tone and behavior. The two oscillators of Ultra Analog VA appear on the left of this view. They are followed by the two filter-amplifier lines and their associated mixers. One can switch from one line to the other by clicking on the tabs to the right of the oscillators. This reveals the main parameters of the filter and amplifier modules as well as that of the LFO module and envelope generators used as modulation sources. To the right of the interface one finds the detailed or expert view of each of the synthesis modules giving access to all their parameters. One can switch to any of these modules by clicking on the corresponding tab to the left of the modules. The Oscillator module is the main sound source of Ultra Analog VA and offers the features of the most reputed analog oscillators. It provides a fine control on the pitch, standard waveforms, a sub-oscillator, and hard synchronization. The Oscillator module is implemented using precise modeling algorithms rather than wave tables providing alias free sources with clean pulse width modulation and synchronization. The Shape drop down menu is used to choose the wave form generated by the oscillator. Wave forms include sine wave, saw tooth, rectangular and white noise as shown in Figure 6. When the Shape is set to rectangular, one has additional control and can adjust the pulse width of the rectangular wave. This parameter is controlled using the PW knob. In its leftmost position the pulse is very narrow while in its rightmost position the wave is perfectly square and only the odd harmonics are heard. Note that the pulse width of the rectangular waveform can be modulated with the signal received from the LFO module. The amount of modulation, around the value set with the PW knob, can be set from the LFO module using the VCO PW knob. Figure 6: Choice of wave forms provided by the Oscillator module. The pitch of the Oscillator module can be adjusted using the Octave, Semi and Detune controls. The Octave control allows one to transpose the pitch by octaves (upper or lower) while the Semi control is used to transpose the pitch by semitones. To adjust these parameters, click on the corresponding button to select it and drag the mouse (or use the finger on a track pad) up or down to select a value. The Detune knob is used to slightly detune the oscillator. When the Detune knob is in its center position, there is no detune while turning it clockwise or anti-clockwise increases or decreases the pitch respectively. The pitch of the Oscillators module can be modulated by the pitch signal received from the MIDI keyboard and/or the LFO module. The amount of modulation from these sources is adjusted by using the Key and the VCO Detune gain knob from the LFO module. In order for the oscillator to respond to the keyboard with an equal tempered scale, the Key knob of the Oscillator module must be set to its center position. The Oscillator module includes a ramp generator which allows one to obtain a pitch variation when a key is depressed. The Ramp modulation knob is used to set the starting pitch of the oscillator while the Decay knob determines the time for the pitch to glide from this starting value to the effective pitch. The starting pitch can be set from -72 to +72 semi-tones with respect to the effective pitch by turning the Ramp knob clockwise. There is no pitch change when this control is in its middle position. The Oscillator module is equipped with a sub-oscillator which generates a wave one octave below the pitch of the oscillator. The shape of the sub-oscillator signal is a square wave when the wave shape of the Oscillator is set to Rect or Saw and a sine wave when it is set to Sine. The amount of this sub-oscillator signal in the output signal of the oscillator is adjusted with the Sub knob. When this knob is fully turned to the left, the sub-oscillator is muted. Note that when the oscillator is used in its Sync mode (see section 4.2.1 below), the sub-oscillator becomes unavailable. The Oscillator module features a hard synchronization mode which is toggled on or off with the help of the Hard Sync button. Synchronization involves a master and a slave oscillator. In this mode, the signal from the slave Oscillator is reset, or in other words restarted, at the beginning of each period of the waveform of the master oscillator which therefore acts as a master clock as shown in Figure 7. The perceived pitch of the final output of the oscillator module is the same as that of the master oscillator while the frequency of the slave or synced oscillator only affects the harmonic content and therefore the timbre of the resulting signal. 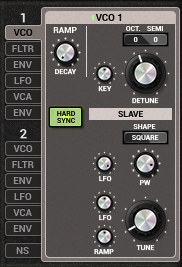 The Shape control applies to the shape of the slave oscillator. The shape of the oscillation of the master is indeed irrelevant as it is only used to generate a master clock signal. In hard sync mode, the frequency of the master oscillator is determined by the settings of the Octave, Semi and Key controls. The frequency of the slave oscillator is adjusted using the Tune knob and its value is presented as a ratio between the frequency of the slave and that of the master oscillator. It can take values between 1 and 20 and can be modulated by the ramp signal of the oscillator envelope using the Ramp knob and the output from the LFO module. Note that in sync mode, the sub-oscillator knob is not available. 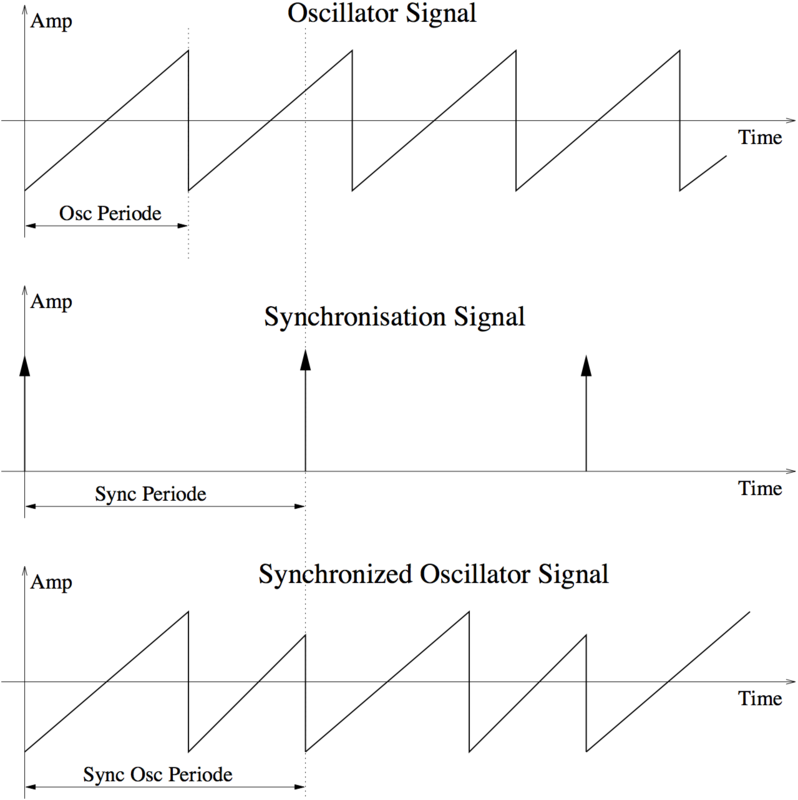 Figure 7: Synchronization of the oscillator. 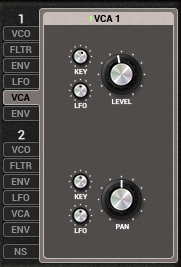 Ultra Analog VA is equipped with two multi-mode filters. The filters are patched in a flexible way in order to allow their use in parallel, in series or any combination of both. For even more flexibility, the cutoff frequency of the Filter 2 can also be locked to that of Filter 1. Each of the multi-mode filters include a resonant low-pass, band-pass, high-pass, notch and two formant filters which can be selected using the Type drop-down menu. The order of the filters can be adjusted to 2 (-12 dB/oct for low-pass and high-pass and -6 db/oct for band-pass) or 4 (-24 dB/oct for low-pass and high-pass and -12 db/oct for band-pass) with the help of the Order parameter. Furthermore different saturation algorithms, selected with the Drive drop-down menu, can be applied to the filters. The resonance or cutoff frequency of the filters is adjusted with the Frequency knob while the amount of resonance is controlled with the Resonance knob. When a formant filter is used, the Resonance knob is used to cycle between the vowels (a, e, i, o, u). The cutoff frequency and resonance of the filters can be modulated with different modulation sources. The Key knob allows one to adjust the amount of variation with the pitch signal from the keyboard while the Env and LFO knobs are gain knobs applied to the signal received from the Filter Env envelope and LFO modules respectively. Let’s now have a closer look at the different filter types available. Figure 8: Frequency response of the low-pass filter. A low-pass filter is used to remove the higher spectral components of the signal while leaving the lower components unchanged. The frequency at which attenuation begins to take effect is called the cutoff frequency and it is controlled using the Frequency knob. 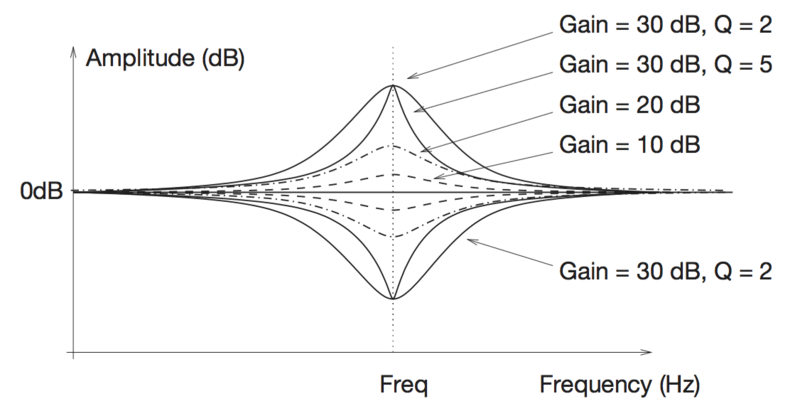 In a resonant filter, frequencies located around the cutoff frequency can also be emphasized by an amount called the quality factor or Q-factor of the filter as illustrated by Figure 8. This parameter is adjusted using the Resonance knob. The higher the Q-factor, the louder and sharper the response of the filter around the cutoff frequency. 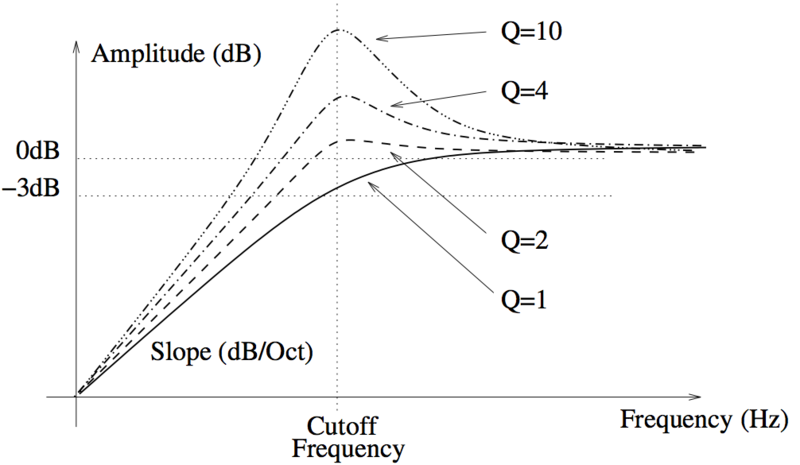 When the Q-factor is set to 1 (Q knob fully turned to the left), there is no emphasis around the cutoff frequency and the attenuation is -3dB at the cutoff frequency. The attenuation for frequencies located above the cutoff frequency depends on the order of the filter which is set by the Order menu, a slope of -12dB/Oct corresponding to a second order filter and a slope of -24dB/Oct to a fourth order filter. Figure 9: Frequency response of the high-pass filter. The high-pass resonant filter works exactly in the opposite manner as the low-pass resonant filter by removing the frequency component of a signal located below the cutoff frequency while leaving those above the cutoff frequency unchanged. 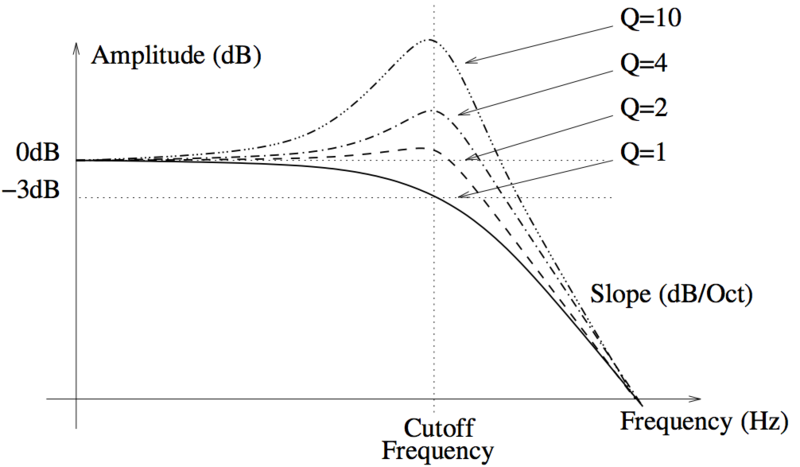 Similarly to the low-pass filter, the Q-factor controls the emphasis of frequencies located around the cut-off frequency. 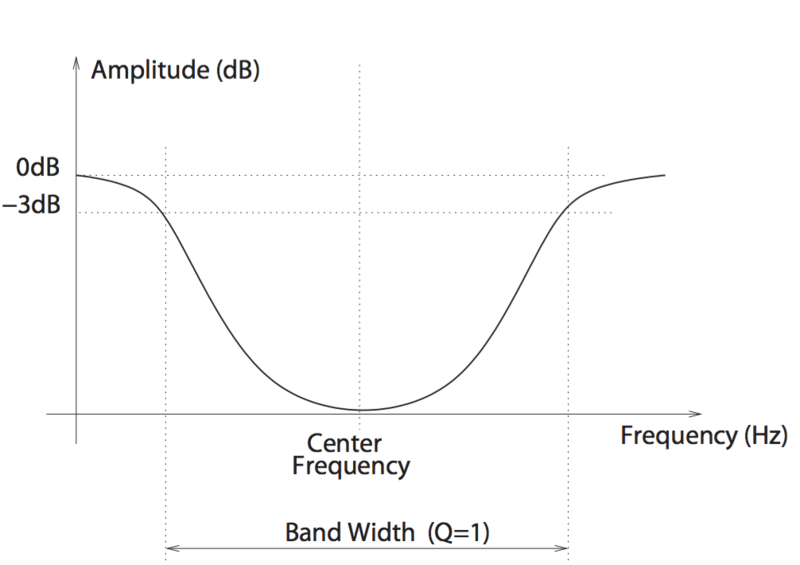 Figure 10: Frequency response of the band-pass filter. 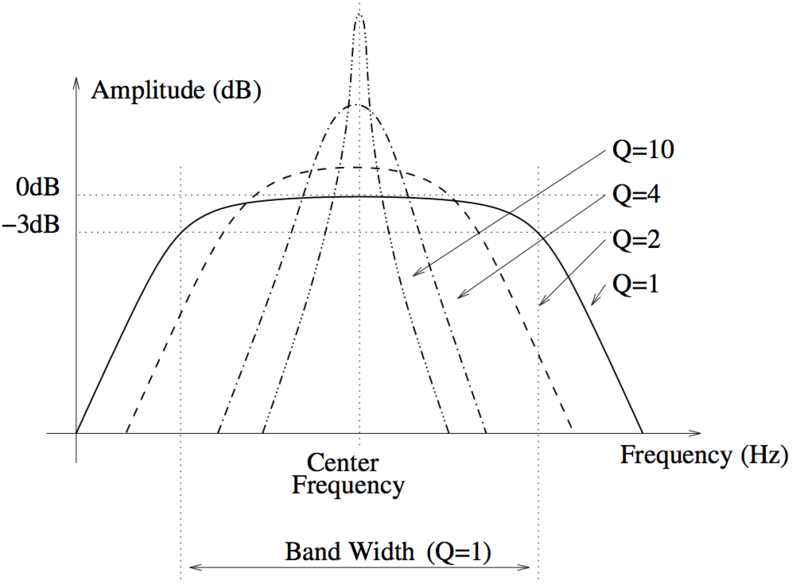 The behavior of a band-pass filter is to let the frequencies in a band located around a center frequency and to attenuate the frequencies outside of this band as shown in Figure 10. The bandwidth of the band-pass filter is set with the Resonance knob while the center frequency is set with the Frequency knob. The Order control sets the order of the filter. This parameter affects the slope of the roll-off on both sides of the center frequency. For a second order filter the slope is -6dB/Oct while for a fourth order filter it is -12dB/Oct. Figure 11: Frequency response of the notch filter. The notch filter, does essentially the opposite of the band-pass filter. It attenuates the frequencies in a band located around the center frequency and leaves those outside of this band unchanged as shown in Figure 26. The Frequency knob is used adjust the center frequency and the Resonance knob sets the bandwidth of the notch. Note that the center frequency is totally removed from the spectrum of the output signal of the filter. Figure 12: Frequency response of the formant filter. The formant filter reproduces the filtering effect of the vocal tract in the human voice. By changing the position of the tongue, the opening of the mouth and opening or closing the nasal cavities one can change the filter applied to the glottal signal and thus produce the different vowels. Measurements have shown that this filter can be modeled by three peaking EQ filters corresponding to the three main cavities of the vocal tract as shown in Figure 12 and also known as formants. By moving the parameters of these three filters (frequency, amplitude and Q-factor) one can cycle between all the vowels. 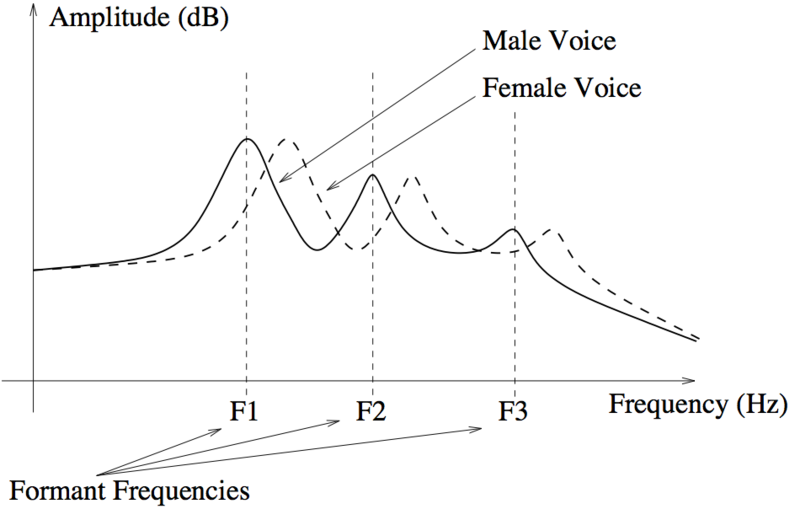 The effect of the Frequency knob on the formant filter is to offset all the formants by the same factor and it is used to switch between male voice (left position), female voice (center) and child (right position). The Resonance knob is used to cycle between vowels. Note that changing these parameters can be automated by using the different modulation signals. As seen in the preceding sections, some filters can boost the signal in some regions of the spectrum. Theoretically, with a high Q-factor the amplification can reach up to 50dB, but in real life, electronic components saturate before this level is reached and saturation is introduced in the signal. In other words, the output signal of a circuit can raise linearly up to a certain value but then begins to raise more slowly up to a value where the output is clipped to the maximum output value allowed by the circuit. This effect is typical of the sound signature of vintage circuits and is implemented in Ultra Analog VA through the Drive control as shown in Figure 13. There are 6 different saturation patterns implemented, the three first being symmetrical, meaning that the saturation is the same for positive and negative values of the signal while for the three remaining the distortion pattern applied is not the same for positive and negative values of the signal. Figure 13: Saturation curves of the resonant filters. 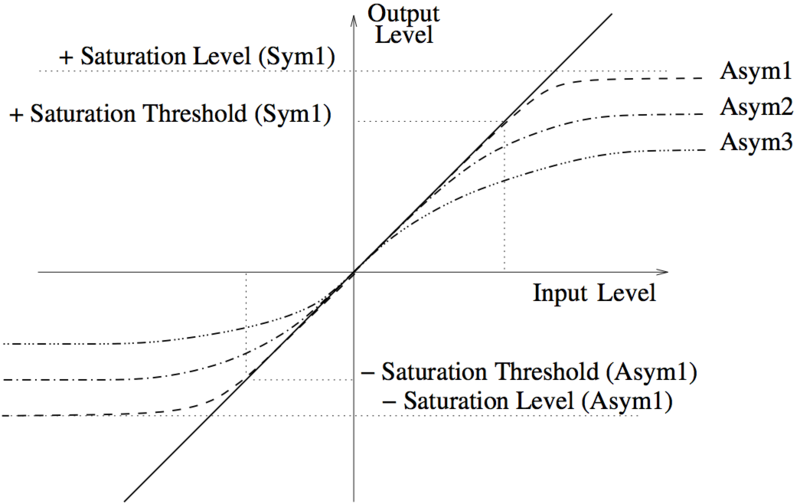 For asymmetrical curves, the saturation level and threshold are different for positive and negative values of the input level. The distortion algorithms are selected with the Drive drop-down menu and are numbered from one to three for both symmetrical and asymmetrical saturation. These distortion algorithms range from very low distortion (clean circuit) to very high distortion. The Filter 2 module can be enslaved to the Filter 1 module. This can be done by clicking the Slave toggle switch on the Filter 2 module. In this mode, the frequency of the Filter 2 module follows exactly that of the Filter 1 module. The Frequency knob on the Filter2 module is then used to adjust the offset frequency between the Filter 1 and Filter 2 modules. When slaved, the cutoff frequency of Filter 2 module follows exactly that of the Filter 1 module including the effects of the modulation signals from the keyboard, LFO or envelope generator acting on the Filter 1 module. Note that the modulation entries on the Filter 2 module are kept active so do not forget to disable them in order to have the desired effect. The filter mixers allow one to control how the signal from the different sources, the two oscillators and the noise source, are routed to the filters. 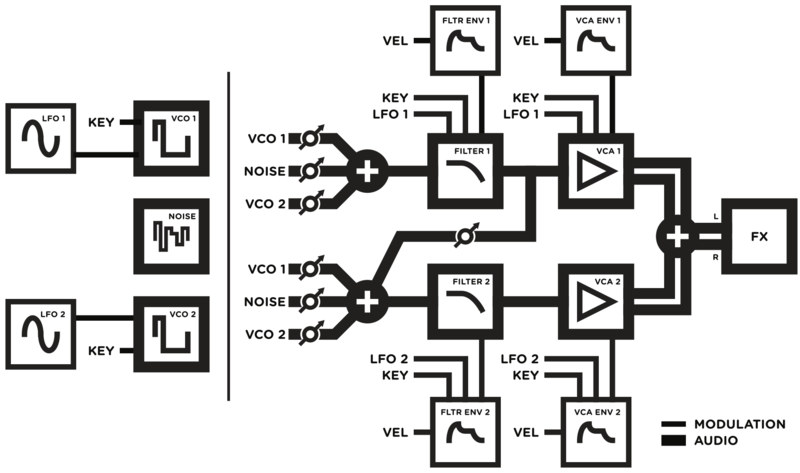 The amount of signals received by the filters from the the VCO1 and VCO2 modules is adjusted by the Vco1 and Vco2 knobs. These control simply apply a gain factor to the signal received from the oscillators. The gain is increased by turning the knobs clockwise from a value of zero (-inf dB) to a factor of about 3 (10 dB). In the same way, the amount of signal from the noise source is adjusted using the Noise gain knob. Finally, signal from the Filter 1 module can be routed to the input of the Filter 2 module. The amount of signal is controlled using the Filter 1 knob appearing on the mixer of the second filter. In order to have the two filters strictly in series, this knob should be turned clockwise and the VCA 1 switched off as the output of the first filter is hard wired into the input of the VCA 1 module. In this way, the output signal only comes out from the second amplifier after going through the two filters. After filtering, the signal is routed to an amplifier in order to add an amplitude envelope and panning effect to the sound. Both the Filter 1 and Filter 2 modules have their own amplifier section, the Amp 1 and Amp 2 modules, which allows one to keep the signal coming from each filter totally independent from the other. The two main controls of the amplifier module are the Level knob and the Pan knob. The Level knob is used to adjust the overall level of the amplifier while the Pan knob is used to position the sound in the stereo field. The source can be positioned from left to right by turning the Pan knob clockwise; it is centered when the knob is in its center position. The level of the sound is always modulated by the signal from the Amp Env module which is hard-wired to the Amp module. The level of the sound across the overall range of the keyboard can also be adjusted using the Key modulation knob. In its center position, the sound level is the same across the keyboard. Turning the Key knob clockwise boosts high notes and decreases the amplitude of low notes while turning it to the left boosts low notes while decreasing the amplitude of high notes. Note that the middle C key (C3, MIDI note 60) always sounds a the same level regardless of the position of the Key knob. The output signal from the LFO module can be used for adding a tremolo effect to the sound. The pan value can be modulated by signals from the LFO, the Amp Env modules and the pitch of the note played. The modulation signals moves the source relative to the source position determined by the settings of the Pan knob. Negative values of the modulation signal move the source to the left of the source while positive values move it toward the right. Using the LFO module as a modulation source moves the signal from left to right at the frequency of the signal from the LFO module. Using the signal from the Env module as the modulation source moves the source to one side of the source and brings it back to its original position. Note that since the sign of the envelope signal is always the same, the source would need to be positioned completely to the left or to the right (Pan knob in its leftmost or rightmost position) in order for the source to sweep the entire space. Finally, the pitch signal from the keyboard positions notes depending on their pitch, low notes to the left and high notes to the right where the middle C is the reference note positioned at the location determined by the Pan knob. The Noise module generates white noise and is followed by a -6dB/Oct low-pass filter used to adjust the frequency content of the noise. The Color knob is used to vary the cutoff frequency of the built-in low-pass filter. Turning this knob to the right increases this frequency and therefore increases the high frequency content of the noise until, in its rightmost position, the filter is fully opened. The Noise knob on the filter mixers is used to control the amount of noise sent to each filter. The LFO module is used as a modulation source for the Oscillator, Filter and Amplifier modules. On the LFO module, one can adjust the waveform, the phase of the signal and fade-in behavior. The waveform of the LFO is selected with the Shape drop-down menu. The possible values are Sine for sinus, Tri for triangular, Rect for rectangular and Rnd and Rnd 2 for the two random modes. In the case of the triangular and rectangular waves, the PW (Pulse Width) knob is used to control the symmetry of the wave. 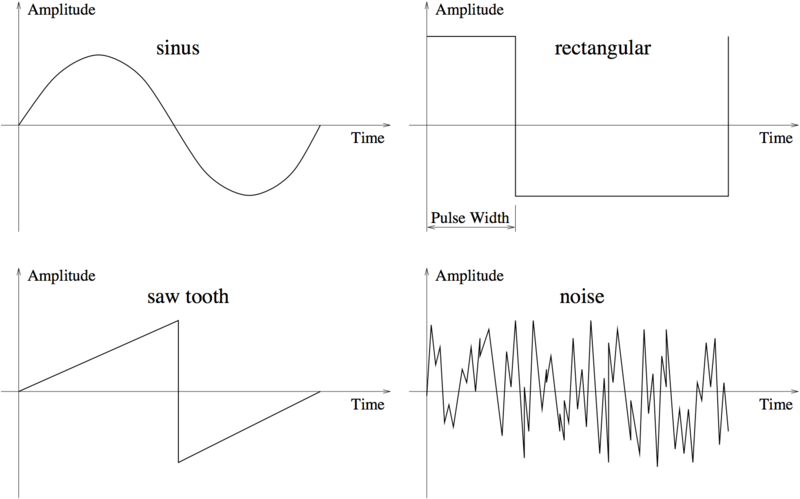 This allows one to go from a pulse to a square wave when a rectangular waveform is selected, and from a saw-tooth to a perfectly triangular wave when the triangular waveform is selected. Note that the PW knob has no effect on the Sine, Rnd and Rnd 2 waveforms. When the Shape control is set to rnd, the LFO outputs random values at the rate determined by the Sync control or the Rate knob. In this case, the output value from the LFO remains constant until a new random value is introduced. The Rnd 2 mode reacts almost like the preceding mode except that the LFO module ramps up or down between successive random values instead of switching instantly to the new value. There are two ways to adjust the rate, or frequency, of the output of the LFO module. If the Sync switch is in its off position, the rate is fixed with the Rate knob. When the Sync switch is on, the frequency of the oscillator is fixed relative to the frequency (tempo) of the host sequencer or the master clock (see 4.4.1) in standalone mode. Sync values are adjusted using the Sync Rate control and range from 1/8 of a quarter note (a thirty-second note) to 16 quarter notes (4 whole notes). 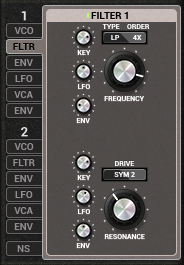 The LFO module can also be synced to a triplet (t) or a dotted note (d). Note that when the Sync control is depressed, the Rate knob has no effect. The LFO module behaves in a polyphonic way which means that a low frequency oscillator is associated with each voice of the polyphony. This allows the LFO module to control notes played on the keyboard individually. The gate signal received from the keyboard is used to reset the LFO waveform when a note is played on the keyboard. The specific point in the waveform where the LFO module starts generating signal is determined by the position of the Phase knob and whether or not the LFO is in reset mode. The reset mode is enabled by clicking on the Reset button. In this mode, the phase of the output signal of the LFO corresponding to a polyphonic voice is fixed and adjusted with the Phase knob. This means that every time a note is depressed on the keyboard and a gate signal is received from the Keyboard module, the LFO module starts generating signal for this specific voice starting at a specific point in the cycle of the waveform. The initial phase of the signal is determined with the Phase knob which enables one to select values over a full period of the waveform. The value of the phase lag is increased by turning the knob clockwise and is equal to from 0 to 100 % (0 to 360 degrees). This feature enables, for example, the triggering of filter sweeps or panning effects that always start at the same point every time a note is played. When the LFO is not in Reset mode (Reset button off), the phase of the signal is random and determined within a range fixed by the Phase knob. Turning this knob clockwise increases the range to values located at different point of the wave period as explained above. The main interest of this mode is to keep voices uncorrelated when chords are played. Indeed, the LFO modulation signals corresponding to the different voices then start at different points even if all the notes are triggered at the same time. Note that when the LFO module is not in Reset mode and the Phase knob is fully turned to the left (phase of 0 degree), the synthesizer behaves as if the LFO was monophonic and all the voices played were following this single LFO. 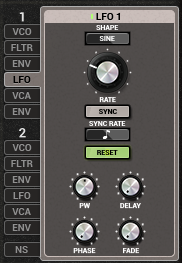 One more feature of the LFO module is the possibility to add a fade-in effect to its output signal. The duration of this fade-in can be adjusted within the range of 0 to 5 seconds, as determined by the Fade knob. Turning this knob fully to the left results in a value of 0 which is equivalent to removing the fade-in effect. 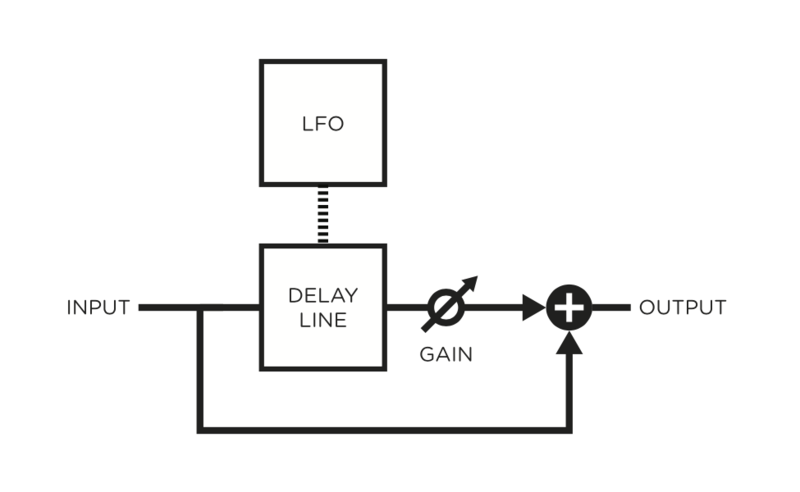 The time at which the LFO signal is introduced can even be controlled by adding a delay to the fade in. This parameter can also be set to values varying between 0 and 5 seconds, as determined by the Delay knob. Note that this knob is effective even if the Fade value is adjusted to zero. In this case, the signal from the LFO module si simply delayed. Figure 14: Fade in feature of the LFO. Each row of Ultra Analog VA is equipped with two envelope generators, the Filter Env and Amp Env modules which are used to modulate the Filter and Amp modules. Both envelope generators have the same user interface and offer the same functions. Envelopes are generated through the use of a standard ADSR (attack, decay, sustain, release) approach including MIDI velocity modulation and looping capabilities. Figure 15: Response curve of an envelope generator. Broken line: exponential, full line: linear. The envelope modules generate a four segment envelope: attack, decay, sustain, release. The attack time is adjusted using the Attack knob. The attack time can also be modulated with the velocity signal received from the MIDI keyboard to make the attack time shorter as the velocity increases, the intensity of this effect being controlled using the Vel knob on the left of the Attack knob. When this knob is in its leftmost position, the attack is only determined by the value of the Attack knob, turning the knob clockwise increases the influence of the velocity signal until the attack time is strictly determined by the inverse of the velocity signal when the Vel knob is fully turned to the right. The decay time is set with the Decay knob. The sustain phase of the envelope generator lasts from the end of the decay phase until the key is released. When the Sustain knob is fully turned to the left, the sustain level is zero and there is no sustain phase while fully turned to the right, the sustain level is at maximum and there is no decay phase. When the key is released, the envelope generator toggles to the release phase and the envelope signal decreases from the value at the end of the sustain phase to zero in a time set by the Release knob. Note that during the sustain phase, the envelope signal can be made to decrease even if a key is still depressed. The time taken to go from the level set by the Sustain knob to a value of zero is then determined by the value of the Time knob located below the Sustain knob. 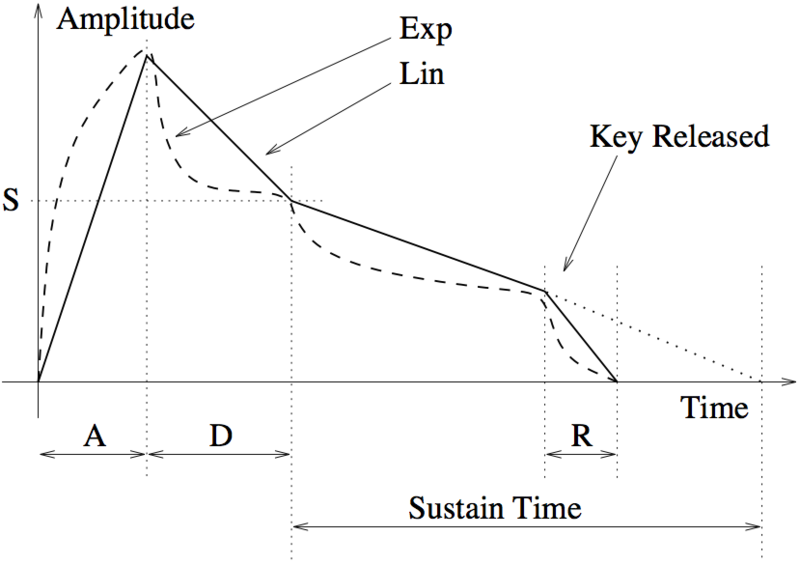 When the Time knob is fully turned to the left, the envelope signal falls to zero right after the end of the decay phase; when the knob is in it rightmost position, the sustain level is held as long as the key is depressed. Finally, the overall level of the envelope can be controlled with the velocity signal from the keyboard through the Vel slider located to the left of the Sustain knob and behaves in exactly the same way as the Vel parameter associated with the Attack knob. We have so far determined the shape of the envelope by adjusting the duration of the different phases as well as their level. The envelope signal can further be modified by adjusting the shape of the envelope segments. These are linear when the Exp button is in its off position and become exponential when it is switched on as shown in Figure 15. The Free button sets the envelope into free-run mode. This allows one to bypass the sustain phase of the envelope or in other words, to go directly from the decay phase to the release phase regardless of the amount of time a key is depressed. This mode is used to choose how the envelope generator reacts when a new note is played before the end of the preceding one. When this occurs, two strategies are possible. The first one consists in triggering a new envelope, from the attack phase, when the new note is played. The second consists in applying the current envelope signal of the first note to the second note which produces a legato effect. The first strategy is adopted when the Retrig button switched on while the second is applied when it is in its off position. Note that when the keyboard is in polyphonic mode and the envelope generator in retrig mode, the envelope generator behaves in a monophonic manner, reacting to a logical OR between all the gates signal from the different notes played on the keyboard. In other words the envelope generator is only triggered by the first note played on the keyboard and then remains in the sustain stage until the last note is released. 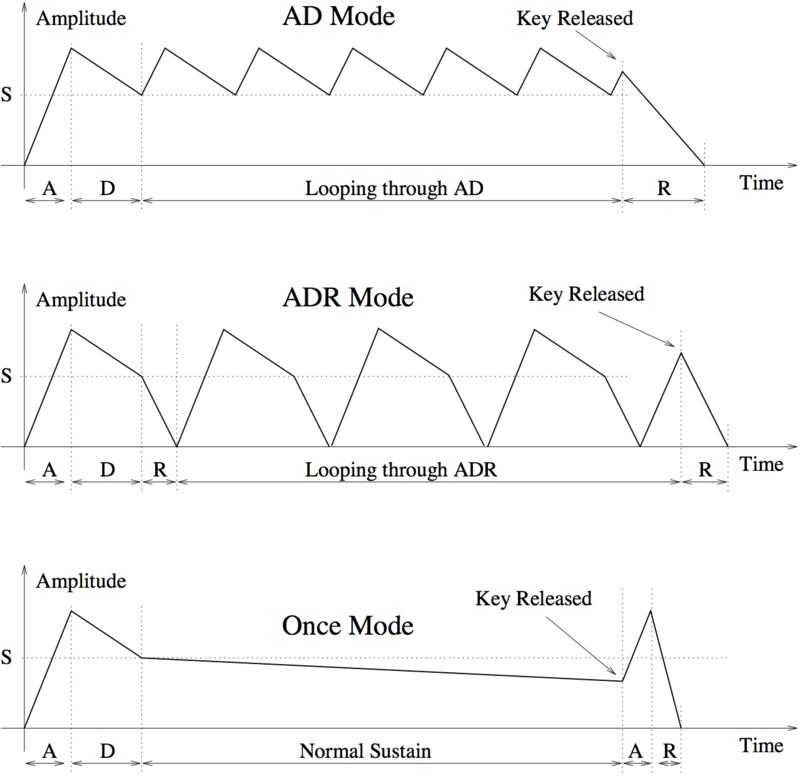 The envelope generator features three loop modes: AD, ADR and Once. These modes allow the envelope to cycle between several stages of the envelope until the key is released and are selected from the Loop drop-down menu. Figure 16: Loop mode of an envelope generator. In the AD mode, the envelope begins with the attack and decay phases as usual, but rather than holding the sustain level, it repeats the attack (from the sustain level) and the decay phases until the note is released. When the note is released the envelope signal returns to zero following the release phase. The ADR mode is quite similar to the preceding mode and only differs in that the looping is done by cycling trough the attack, decay and release phases. Finally, in the Once mode, the envelope is played normally but the envelope generator cycles once more through the attack and release phase when the key is released. The FX view is displayed by clicking on the FX button in the utility section at the top of the interface and is based around a Multi-effects module. The Multi-Effects module allows one to process and shape the signal from the piano before sending it to the output. This module comprises an EQ and a Compressor in series with two configurable effect processors and a Reverb. The configuration of the EQ and the Compressor module depends on the position of the SC and Pre butons of these modules as will be explained below. The two effect processors can be set to a different type by using the drop-down menu located at the center of each module for a wide range of possibilities. The effect list includes a Delay, Distortion, Chorus, Flanger, Phaser, Wah Wah, Auto Wah and a Notch filter. The Multi-Effects module is also visible from the Play view just below the utility section. This allows one to see rapidly which effects are selected for a given sound, turn the effects on or off and rapidly adjust the amount of each effect. The Compressor, Equalizer and Reverb can also be adjusted from this view. The EQ module provides equalization over the low, mid, and high frequency bands. It is composed of a low shelf filter, two peak filters, and a high shelf filter in series, labelled LF, LMF, HMF, and HF respectively. The functioning of the low shelf filter is depicted in Figure 17. The filter applies a gain factor to low frequency components located below a cutoff frequency while leaving those above unchanged. The cutoff frequency of this filter is adjusted using the Freq knob and can vary between 40 and 400 Hz. The Gain knob is used to adjust the gain factor applied to the signal in a ±15dB range. In its center position there is no attenuation (0 dB). Turning it clockwise boosts the amplitude of low frequencies while turning it anti-clockwise reduces it. The high frequency content of the signal is controlled with a high shelf filter that works in the opposite manner as the low shelf filter as illustrated in Figure 17. The filter applies a gain factor to components located above a cutoff frequency while leaving those below unchanged. The cutoff frequency of this filter, located above 1 kHz, is adjusted with the help of the Freq knob while the gain factor applied to the signal, in a ±15dB range, is adjusted using Gain knob. In its center position there is no attenuation (0 dB). Turning it clockwise boosts the amplitude of high frequencies while turning it anti-clockwise reduces it. Figure 17: Low and high shelf filters. The EQ module features two peak filters, labeled LMF and HMF, allowing to shape the signal in two frequency bands as illustrated in Figure 18. The filters apply a gain factor to frequency components in a band located around the cutoff frequency of the filters. This cutoff frequency is adjusted using the Freq knob and can vary between 100 Hz and 10 kHz. The gain factor applied a the cutoff frequency is controlled by the Gain knob and can vary in a ±15 dB range. When in its center position there is no attenuation (0 dB). Turning it clockwise boosts the amplitude of frequencies located around the cutoff frequency while turning it anti-clockwise reduces it. The Q knob is used to adjust the so-called quality factor of the filter which controls the width of the frequency band on which the filter is active. In its leftmost position, the frequency band is wide and it gets narrower as the knob is turned clockwise. The SC button (side-chain) is used to determine if the output from the EQ module is to be used as the control signal of the Compressor module as described in Section 4.3.2. Finally, note that all the gain knobs from this module can be accessed directly from the Play view. The Compressor module is used to automatically compress, in other words reduce, the dynamics of a signal. This module receives two input signals. The first one is the signal to be compressed while the second one is a control signal which triggers the compression process when it rises above a given level. The level at which the Compressor starts to enter into action is determined by the value of the Threshold parameter. This value is in dB and corresponds to the amplitude of the input signal as monitored by the first level meter of the module. The amount of compression applied to the part of the signal exceeding the threshold value depends on the Ratio parameter which varies between value of 1:1 and 1:16. This parameter represents the ratio, in dB, between the portion of the output signal from the compressor above the threshold value and the portion of its input signal also exceeding the threshold value. As one might expect, increasing the ratio also increases the amount of compression applied to the signal. For example, a ratio of 1:5 means that if the input signal exceeds the threshold by 5 dB, the output signal will exceed the threshold by only 1 dB. Note that the Ratio parameter can also be adjusted from the Play view. Two other controls affect the behavior of the Compressor. The Attack knob is used to set the time, in milliseconds, before the Compressor fully kicks in after the level of the input has exceeded the threshold value. A short value means that the compressor will reach the amount of compression as set by the Ratio knob rapidly. With a longer attack, this amount will be reached more gradually. In other words, the attack time is a measure of the attack transient time of the compression effect. The Release parameter is similar and represents the amount of time taken by the Compressor to stop compressing once the amplitude of the input signal falls below the threshold value. The Makeup knob is used to adjust the overall level at the output of the Compressor module and is used to compensate from an overall change in signal level due to the compression effect. The location of the Compressor in the signal path depends on the setting of the Pre button. When this knob is on, the Compressor is located at the output from the piano, just before the EQ module. In this position, the input signal of the Compressor and its control signal are both the output signal from the piano. When the Pre button is off, the Compressor is located after the EQ module. In this configuration, the control signal of the Compressor is then the output signal from the EQ module. The input signal to the compressor is determined by the position of the SC button. When it is on, the Compressor is in a side-chain configuration. The input of the Compressor is then the output signal from the piano. When it is off, the input of the Compressor is the output signal from the EQ module. Using the compressor in side chain configuration is useful when one wants to trigger the compressor using other criteria than the general level of the signal to be compressed. For example, a sound with a lot of bass would easily trigger the Compressor when playing low notes. In order to avoid that, the EQ module would be set to filter out low frequency components. This signal would then be used to control the Compressor while the input signal to the Compressor would still include these low frequency components. The attenuation or gain reduction level meter, located in the middle of the module, indicates the amount of compression applied by the module. It is the difference between the input and output signals of the module before makeup gain is applied. 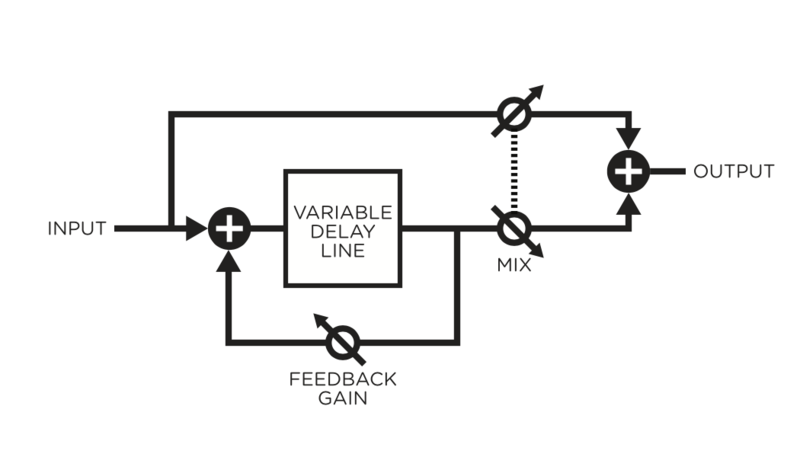 The Delay module consists in a stereo feedback loop with a variable delay in the feedback. It is used to produce an echo effect when the delay time is long (greater than 100 ms) or to color the sound when the delay time is short (smaller than 100 ms). The Delay knob is used to adjust the amount of delay, in seconds, introduced by the effect. Turning this knob clockwise increases the delay. The Feedback parameter is a gain factor, varying in the range between 0 and 1, applied to the signal at the end of the delay lines. It controls the amount of signal that is re-injected in the feedback loop. In its leftmost position, the value of this parameter is 0 and no signal is re-introduced in the delay line which means that the signal is only delayed once. Turning the knob clockwise increases the amount of signal re-injected at the end of the feedback loop and therefore allows one to control the duration of the echo for a given delay time. In its rightmost position, the gain coefficient is equal to 1 which means that all the signal is re-injected into the feedback loop and that the echo will not stop. In addition to this gain factor, low pass filtering can also be applied to the signal re-injected into the feedback loop. The cutoff frequency of this filter is controlled using the Cutoff knob. The Pan knob is used to balance the input signal between the left and right channels. In its leftmost position, signal will only be fed into the left delay line and one will hear clearly defined echo first from the left channel and then from the right channel and so on. In its rightmost position, the behavior will be similar but with the first echo coming from the right channel. These two extreme position correspond to the standard ping pong effect but a a less extreme behavior can be obtained by choosing an intermediate position. In particular when the Pan knob is in its center position, an equal amount of signal is sent in both channels. The output signal from the Delay module can include a mix of input signal (dry) and delayed signal (wet). The Wet and Dry knobs are used to adjust the amplitude of each component in the final output. The amplitude of each component is increased by turning the corresponding knob clockwise from no signal to an amplitude of +6dB. Note that the Wet parameter is also adjustable from the Play view. The Multi-Effect module includes three different types of distortion which are selected using the Shape selector knob. The Warm Tube effect applies a smooth symmetrical wave shaping to the input signal resulting in the introduction of odd harmonics in the signal. The Metal distortion is similar to the Warm Tube effect but is slightly asymmetrical resulting in the introduction of even and odd harmonics in the signal. The Solid State distortion applies an aggressive symmetrical clipping to the signal thereby adding high frequency harmonics and resulting in a harsh sound. The Drive control is a gain knob acting on the input signal. This parameter allows one to adjust the amount of distortion introduced in the signal by controlling how rapidly the signal reaches the non-linear portion of the distortion curve applied on the signal. In its leftmost position, the amplitude of the input signal is reduced by -6 dB; turning this knob clockwise allows one to increase its amplitude. Note that the Drive parameter is also adjustable from the Play view. The Tone knob is used to adjust the color of the signal after the distortion algorithm has been applied. In its leftmost position, high frequencies will be attenuated in the signal while in its rightmost position low frequencies will be filtered out from the signal. In its center position, the signal will be left unchanged. The Volume knob is a gain knob acting on the amplitude of the distorted signal. Finally, the Mix knob allows one to control the amount of dry and wet (distorted) signal in the final output signal from the Distortion module. In its leftmost position, there is only dry signal in the output while in its rightmost position one only hears the distorted signal. In its center position, there is an equal amount of dry and wet signal in the output. The chorus effect is used to make a source sound like many similar sources played in unison. It simulates the slight variations in timing and pitch of different performers executing the same part. The effect is obtained by mixing the original signal with delayed version obtained from the output of delay lines as shown in Figure 19. In the case of a chorus effect, the length of the delay lines must be short in order for the delayed signals to blend with the original signal rather than be perceived as a distinct echo. The length of the delay line can be modulated introducing a slight perceived pitch shift between the voices. The amount of modulation of the length of the delay lines is adjusted using the Depth knob. In the left position, there is no modulation and the length of the delay lines remains constant. As the knob is turned to the right, the length of the delay line starts to oscillate by an amount which increases as the knob is turned clockwise thereby increasing the amount by which the different voices are detuned. The frequency of the modulation is fixed with the Rate knob. The Fat button is used to control the number of voices in the chorus effect. Switching this button on increases the number of voices. The Spread knob is used to adjust the amount of dispersion of the different voices in the stereo field. When in its leftmost position, there is an equal amount of left and right output signal on each channel. In other words the signal is the same on both channels. In its rightmost position, there is complete separation between the channels, the left output from the chorus is only sent to the left channel while the right output of the chorus is only sent to the right channel. Finally, the Mix knob allows one to mix the dry and wet signals. In its leftmost position, there is no output signal from the chorus and one only ears the dry input signals. In its rightmost position, one only ears the wet signal from the chorus module. In its center position, there is an equal amount of dry and wet signal in the output signal from the module. The Flanger module implements the effect known as flanging which colors the sound with a false pitch effect caused by the addition of a signal of varying delay to the original signal. The algorithm implemented in this module is shown in Figure 20. The input signal is sent into a variable delay line. The output of this delay is then mixed with the dry signal and re-injected into the delay line with a feedback coefficient. The effect of the Flanger module is to introduce rejection in the spectrum of the input signal at frequencies located at odd harmonic intervals of a fundamental frequency as shown in Figure 21. The location of the fundamental frequency f0 and the spacing between the valleys and peaks of the frequency response is determined by the length of the delay line (f0 = 1/(2delay)), the longer the delay, the lower is f0 and the smaller the spacing between the harmonics while decreasing the delay increases f0 and hence the distance between the harmonics. Figure 21: Frequency response of a Flanger module. Effect of the length of the delay line. The amount of effect is determined by the ratio of wet and dry signal mixed together as shown in Figure 22. As the amount of wet signal sent to the output is increased, the amount of rejection increases. Finally, the shape of the frequency response of the Flanger module is also influenced by the amount of wet signal re-injected into the feedback loop as shown in Figure 23. Increasing the feedback enhances frequency components least affected by the delay line and located at even harmonic intervals of the fundamental frequency. As the feedback is increased, these peaks become sharper resulting in an apparent change in the pitch of the signal. 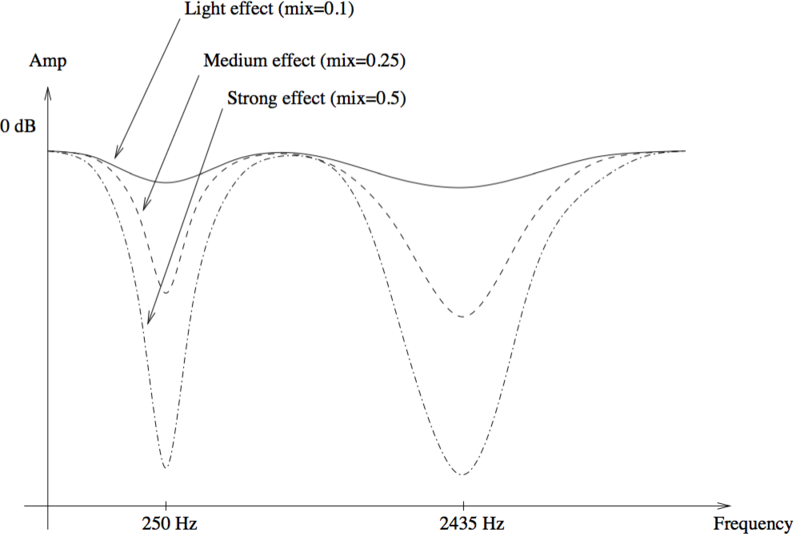 Figure 23: Effect of the amount of feedback on the frequency response of a Flanger module. The delay length, in milliseconds, is adjusted with the Delay knob. The length of this delay can be modulated by a certain amount depending on the adjustment of the Depth knob. In the left position, there is no modulation and the length of the delay line remains constant. As the knob is turned to the right, the length of the delay line starts to oscillate by an amount which increases as the knob is turned clockwise and at a frequency fixed with the Rate knob. The Feedback knob is a gain knob used to fix the ratio of wet signal re-injected into the delay. Finally, the Mix knob determines the amount of dry and wet signal in the output signal from the module. When this knob is adjusted in its leftmost position, only dry signal is sent to the output, in its center position, there is an equal amount of dry and wet signal in the output signal while in its rightmost position, only wet signal is sent to the output. Note that the Depth parameter is also adjustable from the Play view. The Phaser module implements the effect known as phasing which colors a signal by removing frequency bands from its spectrum. The effect is obtained by changing the phase of the frequency components of a signal using an all-pass filter and adding this new signal to the original one. The algorithm implemented in this module is shown in Figure 24. The input signal is sent into a variable all-pass filter. This wet signal is then mixed down with the original dry signal. A feedback line allows the resulting signal to be re-injected into the filter. The effect of the Phaser module is to introduce rejection in the spectrum of the input signal depending on the tuning of the filter. The all-pass filter modifies a signal by delaying its frequency components with a delay which increases with the frequency. This phase variations will introduce a certain amount of cancellation when this wet signal is mixed down with the original dry signal as shown in Figure 25. The rejection is maximum when the phase delay is equal to 180 degrees and a given component is out of phase with that of the original signal. 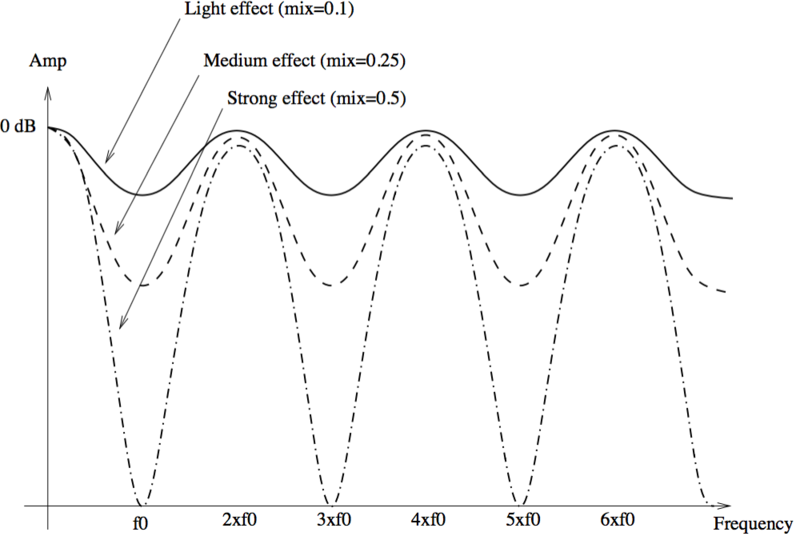 The amount of effect is determined by the ratio of wet and dry signal mixed together as shown in Figure 25. As the amount of wet signal sent to the output is reduced, the amount of rejection increases. The shape of the frequency of the Phaser module is also influenced by the amount of wet signal re-injected into the feedback loop. 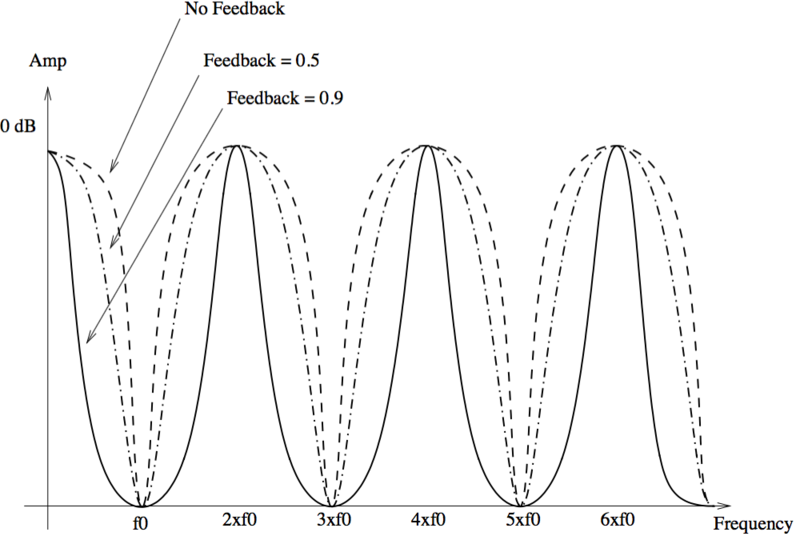 Increasing the feedback enhances frequency components least affected by the all-pass filter. As the feedback is increased, these peaks become sharper. The functioning of the Phaser is very similar to that of the Flanger module. The filtering effect is different however, since the Phaser module only introduces rejection around a limited number of frequencies which, in addition, are not in an harmonic relationship. Figure 25: Frequency response of a Phaser module. Effect of the mix between wet and dry signal on the frequency response. The location of the first notch in the frequency response of the module is adjusted with the Frequency knob This frequency can be modulated by an amount controlled with the Depth knob. In its leftmost position, the location of the first notch is fixed but it starts to oscillate by an amount which increases as the Depth knob is turned clockwise. The frequency of the modulation is controlled using the the Rate knob. The feedback knob is used to fix the amount of wet signal re-injected into the delay. Finally, the Mix knob determines the amount of dry and wet signal sent to the output. When this knob is adjusted in the left position, only dry signal is sent to the output, in its center position, there is an equal amount of dry and wet signal in the output and in the right position, only wet signal is sent to the output. The Multi-Effect module includes 2 different types of Wah effects: wah wah, and auto wah. These effects are used to enhance a frequency band around a varying center frequency using a bandpass filter. In the wah wah effect, the center frequency of the bandpass filter varies at a rate fixed by the user. In the case of the auto-wah, the variations of the center frequency is controlled by the amplitude envelope of the incoming signal. The Freq knob is used to control the central frequency of the filter. Turning this knob clockwise increases the center frequency. In the case of the Wah Wah effect, the center frequency will oscillate around the value fixed by the Freq knob while with the Auto Wah effect, the setting of the Freq will fix the starting point value of the varying center frequency. The Depth knob controls the excursion of the center frequency of the filter. In the case of the Wah Wah effect, this excursion is applied around the value fixed by the Freq knob while in Auto Wah effect the value of the center frequency increases from the value fixed by the Freq knob. Turning this knob clockwise increases the excursion of the center frequency. Note that the Depth parameter is also adjustable from the Play view. Finally, the Rate knob controls the frequency or rate of the modulation of the center frequency of the filter. In the case of the Wah Wah effect, turning this knob clockwise increases the rate of the modulation. In the case of the Auto Wah filter, this knob is labeled Speed and controls the time constant of the envelope follower. Turning this knob clockwise decreases the time constant, or in other words the reaction time, of the envelope follower. The Notch Filter does essentially the opposite of a band-pass filter. It attenuates the frequencies in a band located around the center frequency and leaves those outside of this band unchanged as shown in Figure 26. As was the case for the Wah Wah effect, the filter can be modulated. The Freq knobs is used to control the central frequency of the filter. Turning this knob clockwise increases the center frequency. The Depth knob controls the excursion of the center frequency of the filter around its center frequency. Turning this knob clockwise increases the excursion of the center frequency. Finally, the Rate knob controls the frequency or rate of the modulation of the center frequency of the filter. Turning this knob clockwise increases the rate of the modulation. Note that the Depth parameter is also adjustable from the Play view. Figure 26: Frequency response of a notch filter. The Reverb effect is used to recreate the effect of reflections of sound on the walls of a room or hall. These reflections add space to the sound and make it warmer, deeper, as well as more realistic since we always listen to instruments in a room and thus with a room effect. The best way to evaluate the response of a room is to clap hands and to listen to the resulting sound. Figure 27 shows the amplitude of the impulse response of a room versus time. The first part of the response is the clap itself, the direct sound, while the remaining of the response is the effect of the room which can itself be divided in two parts. Following the direct sound, one can observe a certain amount of echoes which gradually become closer and closer until they can not be distinguished anymore and can be assimilated to an exponentially decaying signal. The first part of the room response is called the early reflexion while the second is called the late reverberation. 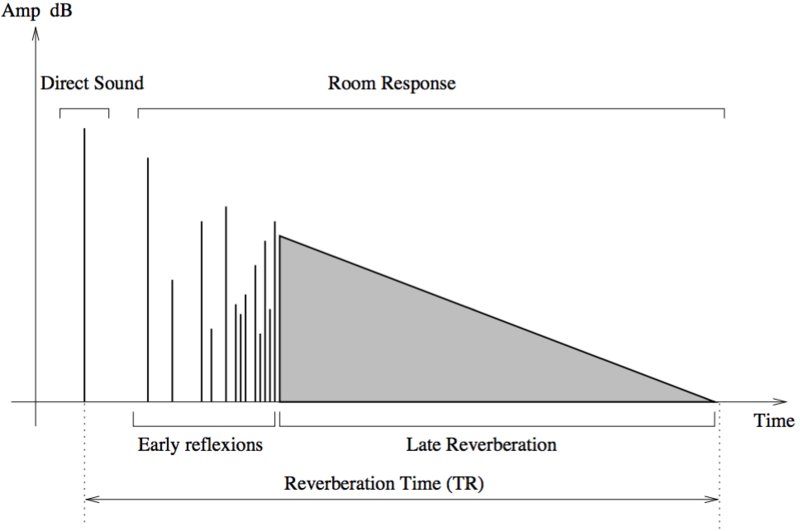 The total duration of the room response is called the reverberation time (RT). Figure 27: Impulse response of a room. The size of a room strongly affects the reverberation effect. The Size selector is used to choose between the Studio, Club, Hall and Large Hall settings each reproducing spaces of different volumes from smaller to larger. The duration of the reverberation time depends on both the size of the room and the absorption of the walls, which is controlled with the Decay knob. In a real room the reverberation time is not constant over the whole frequency range. As the walls are often more absorbent in the very low and in the high frequencies the reverberation time is shorter for these frequencies. These parameters are adjusted with the Low and High knobs respectively. Another parameter which affects the response of a room is its geometry; the more complex the geometry of a room, the more reflexion are observed per unit of time. This quantity is known as the time density and can be set trough the Diffusion knob. In a concert hall, the time density is supposed to be quite high in order not to hear separate echoes which are characteristic of poor sounding rooms. The last parameter which affects our listening experience in a room, is the distance between the sound source and the listener. While the room response is quite constant regardless of the position of the source and the listener, the direct sound (the sound which comes directly from the source) depends strongly on the position of the listener. The farther we are from the sound source the quieter is the direct sound relatively to the room response. The ratio between the direct sound and the room response is adjusted with the Mix knob which in other words is used to adjust the perceived distance between the source and the listener. In its leftmost position, only the direct sound is heard while when fully turned to the right, one only hears the room response. Note that the Mix parameter is also adjustable from the Play view. The Play view is where the main performance oriented modules are located. Key parameters from the Edit and FX view are also included for quick access. This view is loaded when starting the instrument and can be accessed from another view by clicking on the Play button on the top part of the interface. This module is used to control the tempo of the different effects of the FX section as well as that of the LFO and Arpeggiator modules when their respective sync button is switched on. When Ultra Analog VA is launched in standalone mode the clock tempo, in bpm, is set by using the Rate knob. The tempo can also be adjusted by clicking at the desired tempo on the Tap Tempo pad of the module. Once the new tempo is detected, the value of the Rate knob is automatically adjusted. When using Ultra Analog VA in plugin mode, the Tap Tempo pad is replaced by a Sync To Host switch. In its on position, the rate is synchronized with that of the host sequencer. When switched off, the tempo is determined by the value of the Rate knob. The Key module controls how the synthesizer voices respond to the events coming from an external MIDI keyboard or from a MIDI sequencer. The keyboard can be monophonic, allowing one to play only one note at a time, or polyphonic, allowing one the play chords. This behavior is adjusted with the Mode drop-down menu. The Priority control, located below the Mode control, sets the behavior of the keyboard when several notes are depressed at the same time in monophonic mode or when the maximum number of polyphonic voices has been reached in polyphonic mode. In monophonic mode, the Priority determines which of the lower, last, or higher note has precedence when several notes are played. In polyphonic mode, this control determines which of the lowest, highest, or oldest note is muted in order to replace it with the newest note played once the maximum of polyphonic voices has been reached. Note that since this parameter determines the note priority, the stolen note will be the opposite of what appears in the control display. The Error knob adds a random error to the pitch of each note played; as it is turned clockwise, the error increases. This makes all the notes play slightly out of tune. Note that the sustain pedal (MIDI controller number 64) is always active on the Key module. The unison mode allows one to stack voices, in other words, play two or four voices for each note played on the keyboard. This mode creates the impression that several instruments are playing the same note together, adding depth to the sound. Each voice can be slightly detuned relatively to the others by using the Detune knob. Turning this knob clockwise increases the amplitude of the error. Furthermore, voices can be desynchronized by adding a small time lag between their triggering with the Delay knob. There is no delay when the knob is in its leftmost position and it increases (units in ms) as it is turned clockwise. The Glide module is used to make the pitch slide between notes rather than changing immediately from note to note. The Time knob sets the amount of time necessary for the pitch to slide over one octave. The Mode drop-down menu enables one to choose between the Constant or Proportional mode. When in Constant mode, the time necessary for the pitch to slide from one note to another is always the same regardless of the interval between the notes. When set to proportional, the slide time becomes proportional to the width of the interval between the two notes. Clicking on the Legato button switches the module into legato mode and the sliding between two notes then only occurs if the second note is played before the first one is released. When a note is played staccato, or in other words if a key is released before the next one is depressed, there is no glide effect. Note that even though the glide effect is available when the Key module is in polyphonic mode, it is mostly dedicated to monophonic playing. In polyphonic mode, the sames rules apply to individual voices and the overall result is less predictable. The vibrato effect is equivalent to a periodic low frequency pitch modulation. This effect is generally obtained by using an LFO to modulate the pitch signal of an oscillator. In Ultra Analog VA, a dedicated module is provided for this effect. The vibrato module is hard wired and affects the pitch of both oscillators. The Rate knob sets the frequency of the vibrato effect from 0.3 Hz to 10 Hz. The Amount knob sets the depth of the effect, or in other words the amplitude of the frequency variations. In its leftmost position, there is no vibrato and turning the knob clockwise increases the amount of pitch variation. The MW gain knob is used to determine the effect of the keyboard modulation wheel on the depth of the vibrato. When this knob is fully turned to the left, the modulation wheel has no effect but as it is turned clockwise the depth of the vibrato increases when the modulation wheel is used. The increase is always relative to the position of the Amount knob and becomes greater as the MW knob is turned clockwise. The vibrato can be adjusted not to start at the beginning of a note but with a little lag. This lag, in seconds, is set by the Delay knob. The Fade knob allows you to set the amount of time taken by the amplitude of the vibrato effect to grow from zero to the amount set by the Amount knob. The Arpeggiator module allows one to play sequentially all the notes that are played on the keyboard. In other words, arpeggios are played rather than chords. The modules allows one to produce a wide range of arpeggios and rhythmic patterns and to sync the effects to the tempo of an external sequencer. The arpeggio pattern is set by the combination of the value of the Range, Span and Order controls. The Range control is used to select the number of octaves across which the pattern is repeated. When the range is set to 0, there is no transposition and only the notes currently depressed are played. If set to a value between 1 and 4 (its maximum value), the notes played are transposed and played sequentially, over a range of one or more octaves depending on the value of the Range parameter. The direction of the transposition is set with the Span drop-down menu. This parameter can be adjusted to Low for downwards transposition, to High for upwards transposition or wide for transposing both upwards and downwards. Finally, the Order control sets the order in which the notes are played, therefore determining the arpeggio pattern. When set to Forward, the notes are played from the lowest to the highest. When set to Backward the notes are played from the highest to the lowest. In the two last modes, Rock and Roll exclusive and Rock and Roll inclusive, the notes are played forward from the lowest to the highest and then backward from the highest down to the lowest. When using the RnR exclusive mode, the highest and the lowest notes are not repeated when switching direction but in RnR inclusive mode these notes are repeated. Finally, in Chord mode, all the notes are played at once. Rhythmic patterns can be added to the arpeggio pattern by using the 16-step Pattern display. Notes are played as the step display is scanned and the corresponding step is selected (red button on). Notes are played regularly when all the steps of the display are turned on and rhythmic patterns are created by selecting only certain steps. The arrow button below each step is used to fix looping points from which the rhythmic pattern starts being played again from the beginning. The rate at which the arpeggiator pattern is scanned is set by the Rate knob of the Arpeggiator module or can be synced to the master clock of the Clock module. The Rate knob is only effective when the Sync control is set to off. When the Sync control is on, the rate (tempo) is fixed by the master Clock module (see 4.4.1) in standalone mode or the host sequencer in plugin mode. The rhythmic value of each step is set using the Steps parameter. Values can range between a quarter note and a thirty-second note with binary and ternary beat division options. One can then fix the metric of the pattern by setting the loop point of the step display appropriately. The Arpeggiator module is toggled in latch mode by clicking the Latch button to its on position. In this mode, the Arpeggiator keeps playing its pattern when the notes on the keyboard are released and until a new chord is played. The MIDI pitch wheel allows one to vary the pitch of the note played. The pitch wheel can be moved with the mouse but it is also automatically connected to the pitch wheel signal received from your MIDI keyboard. The range of the pitch bend is 2 semi-tones up or down by default but can be changed. To adjust the range of the pitch bend, open the MIDI configuration window by clicking on the MIDI button located just below the MIDI led in the top part of the interface and use the Pitch Bend Range drop-down menu to select the range in semi-tones. The modulation wheel is linked to the Amount parameter of the Vibrato module. It can be activated on screen or from the modulation wheel of your MIDI controller (MIDI controller number 1). The MW gain knob of the Vibrato module is used to control the sensitivity of the vibrato amplitude to the modulation wheel. Note that other parameters can be linked to the modulation wheel using MIDI links as explained in Section ??. The lower part of this view includes a ribbon controller. The ribbon covers seven octaves and notes are played when clicking on the ribbon. The ribbon is useful to test sounds when no MIDI keyboard is connected to your computer. The MIDI LED is located on the left of the level-meter. The LED blinks when the synthesizer receives MIDI signal. If the application is not receiving MIDI signal, make sure that the host sequencer is sending MIDI to Ultra Analog VA. If you are running in standalone mode, make sure that the MIDI controller you wish to use is well connected to your computer and that it is selected as explained in Section 6. The Voices control located in the upper left corner of this section allows one to adjust the number of polyphony voices used by Ultra Analog VA. The number of voices is adjusted by clicking on the control and selecting the desired number of voices. In general, a higher number of voices is desirable but keep in mind that the CPU load is proportional to the number of voices used. The Tune control, located to the right of the MIDI LED, is used to transpose the frequency of the keyboard. This control is composed of two numbers separated by a dot. The first number indicates a value in semi-tones while the second one indicates a value in cents (one hundredth of a semi-tone). The amount of transposition can be adjusted by click-dragging upward or downward on the semi-tone and cent controls. Double clicking on these controls brings back their value to zero. When the value of the Tune parameters is set to 0.00, the frequency of notes are calculated relative to A4 with a frequency of 440Hz. An interesting feature of Ultra Analog VA is that it can be tuned using different temperaments using Scala micro-tuning files. Temperament files are loaded by clicking on the Tune button which opens the Tuning pop-up window and displays the list of available tuning temperament files available. These folders can be displayed directly from Ultra Analog VA by clicking on the Show Tuning Files button at the bottom of the Tuning pop-up window. Selecting a Scala file in the list automatically triggers the loading of the corresponding temperament. The reference note that will be used as the base note for the scale described in the Scala file can be set using the Reference Note control appearing at the bottom of the Tuning window. The frequency of this reference note is calculated relative to the settings of the Tune control. Please note that the reference note does not appear in the window when the default temperament is chosen, it only appears once a Scala file is loaded. The History control allows one to go back through all the modifications that were made to programs since the application was started. In order to travel back and forth in time, use the left and right-pointing arrows respectively. The application will switch between different program states and indicate the time at which they were modified. The Compare button, located above the Program display, is used to switch between Edit and Compare mode. This button is visible only once a modification is applied to a given program. It allows one to revert to the original version of a program in order to compare it with the current version. When in Compare mode, edition is blocked and it is therefore not possible to modify any parameter. The Compare mode must then be switched off by clicking on the Compare button in order to resume edition. The Volume knob is the master volume of the application. It is used to adjust the overall level of the output signal from the synthesizer. General level is increased by turning the knob clockwise. The level meter allows one to monitor peak and RMS (root means square) level of the left (L) and right (R) output channels from the synthesizer. As a limiter is located at the output of Ultra Analog VA, it is important to make sure that the amplitude of the signal remains within values that ensure that no distortion is introduced in the signal at the output. The 0 dB mark on the level meter has been adjusted to correspond to -20 dBFS (full scale). This means that at that level, the signal is -20 dB below the maximum allowed value. This 0 dB level mark should typically correspond to playing at mezzo forte (moderately loud) level. This ensures a headroom of 20 dB which should be more than enough to cover the dynamics of most playing situations and therefore guarantee that no additional distortion is added in the output signal. A peak value mark allows one to follow the maximum level values reached by the output signal. The limiter is triggered when this mark enters the red zone of the level meter (17 dB) and it remains active while the side vertical bars at the top of the lever meter are switched On. The About box is open by clicking on the chevrons located at the very top of the interface or on the product or company logo. The box is closed by clicking again on the chevrons or outside the box. Useful information is displayed in this box such as the program’s version number, the serial number that was used for the authorization and the the email address that was used for registration. The box also includes a link to the pdf version of this manual. This chapter explains how to select and configure Audio and MIDI devices used by Ultra Analog VA. Audio and MIDI configuration tools are accessed by clicking on the Audio Setup button located in the lower left corner of the Ultra Analog VA interface and the MIDI button located just below the MIDI led in upper part of the interface. Note that in plug-in mode the audio and MIDI inputs, sampling rate, and buffer size are set by the host sequencer. Audio configuration tools are available by clicking on the Audio Setup button located in the lower left corner of the Ultra Analog VA interface. The Audio Setup dialog first allows you to select an audio output device from those available on your computer. Multi-channel interfaces will have their outputs listed as stereo pairs. The latency is the time delay between the moment you send a control signal to your computer (for example when you hit a key on your MIDI keyboard) and the moment when you hear the effect. Roughly, the latency will be equal to the duration of the buffers used by the application and the sound card to play audio and MIDI. To calculate the total time required to play a buffer, just divide the number of samples per buffer by the sampling frequency. For example, 256 samples played at 48 kHz represent a time of 5.3 ms. Doubling the number of samples and keeping the sampling frequency constant will double this time while changing the sampling frequency to 96 kHz and keeping the buffer size constant will reduce the latency to 2.7 ms. It is of course desirable to have as little latency as possible. Ultra Analog VA however requires a certain amount of time to be able to calculate sound samples in a continuous manner. This time depends on the power of the computer used, the preset played, the sampling rate, and the number of voices of polyphony used. Note that it will literally take twice as much CPU power to process audio at a sampling rate of 96 kHz as it would to process the same data at 48 kHz, simply because it is necessary to calculate twice as many samples in the same amount of time. Depending on your machine you should choose, for a given sampling frequency, the smallest buffer size that allows you to keep real-time for a reasonable number of voices of polyphony. The list of available MIDI inputs appears at the bottom of the Audio Setup dialog. Click on the Audio Setup button located in the lower left corner of the Ultra Analog VA interface and then click on the checkbox corresponding to any of the inputs you wish to use. Every control on the Ultra Analog VA interface can be manipulated by an external MIDI controller through MIDI control change assignments. In most cases this is much more convenient than using the mouse, especially if you want to move many controllers at once. For example, you can map the motion of a knob on the interface to a real knob on a knob box or to the modulation wheel from your keyboard. As you use the specified MIDI controllers, you will see the controls move on the Ultra Analog VA interface just as if you had used the mouse. On the Ultra Analog VA interface, right-click/Control-click on a control (knob, button) and select the MIDI Learn command. Move a knob or slider on your MIDI controller (this can be a keyboard, a knob box, or any device that sends MIDI). This will link the control of the Ultra Analog VA to the MIDI controller you just moved. To deactivate a MIDI link, simply righ-click/Control-click on the corresponding control on the Ultra Analog VA interface and select the MIDI Forget command. It is possible to define a a set of MIDI links, called a MIDI map, that will be loaded automatically when Ultra Analog VA is launched. Once you have defined a set of MIDI links that you wish to save, click on MIDI button to open the MIDI configuration window and click on the Save Current as Default button. If you make changes to MIDI links after opening the program and wish to revert to the default MIDI map click on MIDI button to open the MIDI configuration window and click on the Load Default button. If you wish to deactivate all the MIDI links at once open the MIDI configuration window and click on the Clear MIDI Map button. Ultra Analog VA responds to MIDI program changes. When a program change is received, the current program is changed to the program having the same number as that of the program change message in the currently loaded bank. If you do not wish Ultra Analog VA to respond to MIDI program changes, open the MIDI configuration window by clicking on the MIDI button and uncheck the Enable Program Changes option. In general, MIDI bank numbers are coded using two signals: the MSB (most significant byte) and LSB (least significant byte) transmitted using MIDI CC (continuous controller) number 0 and 32 respectively. The way these signals are used differs with different manufacturers. In the case of Ultra Analog VA, the value of the MSB signal is expected to be zero while the value of the LSB signal represents the bank number. Banks are therefore numbered from 0 to 127 with this number corresponding to the position of a bank within the list of banks as displayed by the Bank manager (see Section 3.3). For example, an LSB value of 0 corresponds to the first bank in the bank list while an LSB value of 10 corresponds to the eleventh bank in the list. Note that a bank change only becomes effective after the reception of a new MIDI program change signal. If you do not wish Ultra Analog VA to respond to MIDI bank changes, open the MIDI configuration window by clicking on the MIDI button and uncheck the Enable Bank Changes option. The MIDI pitch wheel allows one to vary the pitch of Ultra Analog VA. The pitch wheel can be moved with the mouse but it is also automatically connected to the pitch wheel signal received from your MIDI keyboard. The range of the pitch bend is 2 semi-tones up or down by default but can be changed. To adjust the range of the pitch bend, open the MIDI configuration window by clicking on the MIDI button located just below the MIDI led in the top part of the interface and use the Pitch Bend Range drop-down list to select the range in semi-tones. Ultra Analog VA responds to MIDI modulation (MIDI controller number 1). For more details, please refer to Section 4.4.8. Ultra Analog VA is available in VST, RTAS and AudioUnit formats and integrates seamlessly into the industry most popular multi-track recording and sequencing environments as a virtual instrument plug-in. Ultra Analog VA works as any other plug-in in these environments so we recommend that you refer to your sequencer documentation in case you have problems running it as a plug-in. We review here some general points to keep in mind when using a plug-in version of Ultra Analog VA. 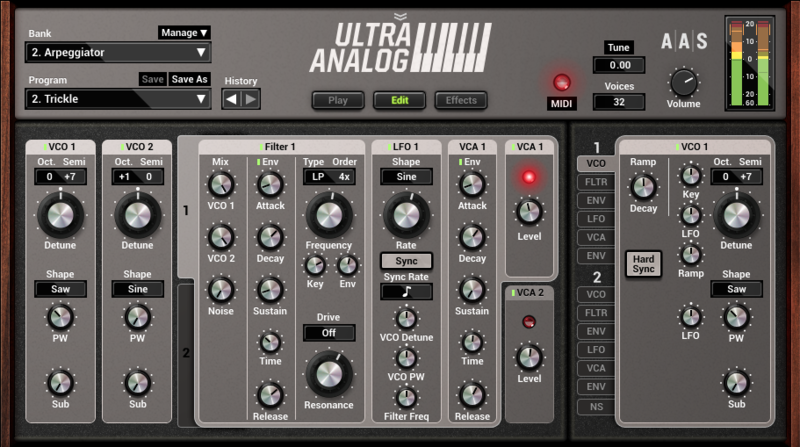 When Ultra Analog VA is used as a plug-in, the audio and MIDI ports, sampling rate, buffer size, and audio format are determined by the host sequencer. Ultra Analog VA supports automation functions of host sequencers. All parameters visible on the interface can be automatized except for the Polyphony, Bank, Program and History commands. Multiple instances of Ultra Analog VA can be launched simultaneously in a host sequencer. MIDI program changes are supported in Ultra Analog VA. When a MIDI program change is received by the application, the current program used by the synthesis engine is changed to that having the same number, in the currently loaded bank, as that of the MIDI program change message. When saving a project in a host sequencer, the currently loaded program is saved with the project in order to make sure that the instrument will be in the same state as when you saved the project when you re-open it. Note that banks of programs are not saved with the project which implies that if you are using MIDI program changes in your project, you must make sure that the bank you are using in your project still exists on your disk when you reload the project. The programs must also exist and be in the same order as when the project was saved. Using a plug-in in a host sequencer requires CPU processing for both applications. The load on the CPU is even higher when multiple instances of a plug-in or numerous different plug-ins are used. To decrease CPU usage, remember that you can use the freeze or bounce to track functions of the host sequencer in order to render to audio the part played by a plug-in instead of recalculating it every time it is played. IMPORTANT! CAREFULLY READ ALL THE TERMS AND CONDITIONS OF THIS AGREEMENT BEFORE OPENING THIS PACKAGE. OPENING THIS PACKAGE INDICATES YOUR ACCEPTANCE OF THESE TERMS AND CONDITIONS. IF YOU DO NOT AGREE WITH THE TERMS AND CONDITIONS OF THIS AGREEMENT, PROMPTLY RETURN THE UNOPENED PACKAGE AND ALL COMPONENTS THERETO TO THE PARTY FROM WHOM IT WAS ACQUIRED, FOR A FULL REFUND OF ANY CONSIDERATION PAID. This software program, any printed materials, any on-line or electronic documentation, and any and all copies of such software program and materials (the “Software”) are the copyrighted work of Applied Acoustics Systems DVM Inc. (“AAS”), its subsidiaries, licensors and/or its suppliers. LICENSE TO USE. The Licensee is granted a personal, non-exclusive and non-transferable license to install and to use one copy of the Software on a single computer solely for the personal use of the Licensee. Use of the Software is subject to this Agreement. RESTRICTIONS ON USE. The Licensee may not nor permit third parties to (i) make copies of any portion of the Software, other than as expressly permitted under this Agreement; (ii) modify, translate, disassemble, decompile, reverse engineer or create derivative and/or competitive products based on any portion of the Software; (iii) provide use of the Software in a network, timesharing, interactive cable television, multiple CPU service bureau or multiple user arrangement to users not individually licensed by AAS, other than as expressly permitted by the terms of this license. The Software is licensed to you as a single product. Its component parts may not be separated for use on more than one computer. OWNERSHIP. AAS retains title to the Software, including but not limited to any titles, computer code, themes, objects dialog concepts, artwork, animations, sounds, audio effects, methods of operation, moral rights, any related documentation and “applets” incorporated into the Software. AAS retains ownership of and title to all intellectual property rights in the Software, underlying technology, related written materials, logos, names and other support materials furnished either with the Software or as a result of this Agreement, including but not limited to trade secrets, patents, trademarks and copyrights therein. Licensee shall not remove or alter any copyright or other proprietary rights notices contained on or within the Software and shall reproduce such notices on all copies thereof permitted under this Agreement or associated documentation. LIMITED WARRANTY. Except for the foregoing, THE SOFTWARE IS provided “AS IS” without warranty or condition of any kind. AAS disclaims all warranties or conditions, written or oral, statutory, express or implied, including but not limited to the implied warranties of merchantable quality or fitness for a particular purpose, title and non-infringement of rights of any other person. AAS does not warrant that THE SOFTWARE will meet the Licensee’s requirements or that the operation of the software will be uninterrupted or ERROR-FREE. LIMITATION OF LIABILITY. TO THE MAXIMUM EXTENT PERMITTED BY APPLICABLE LAW, IN NO EVENT WILL AAS BE LIABLE TO THE LICENSEE OR ANY THIRD PARTY FOR ANY INDIRECT, SPECIAL, CONSEQUENTIAL, INCIDENTAL OR EXEMPLARY DAMAGES WHATSOEVER, INCLUDING BUT NOT LIMITED TO LOSS OF REVENUE OR PROFIT, LOST OR DAMAGED DATA, BUSINESS INTERRUPTION OR ANY OTHER PECUNIARY LOSS WHETHER BASED IN CONTRACT, TORT OR OTHER CAUSE OF ACTION, EVEN IF AAS HAS BEEN ADVISED OF THE POSSIBILITY OF SUCH DAMAGES, EXCEPT IN RELATION TO GROSS NEGLIGENCE OR WILFUL BREACH OF THIS AGREEMENT BY AAS. NO AAS AGENT, REPRESENTATIVE OR DEALER IS AUTHORIZED TO EXTEND, MODIFY OR ADD TO THIS WARRANTY ON BEHALF OF AAS. THE TOTAL LIABILITY OF AAS FOR DAMAGES, WHETHER IN CONTRACT OR TORT, UNDER OR RELATED IN ANY WAY TO THIS AGREEMENT SHALL BE LIMITED TO THE LICENSE FEES ACTUALLY PAID BY LICENSEE TO AAS, OR IF NO FEES WERE PAID, AAS’ LIST PRICE FOR THE SOFTWARE COVERED BY THIS LICENSE. THE EXCLUSION OF IMPLIED WARRANTIES AND/OR THE LIMITATION OF LIABILITY IS NOT PERMITTED IN SOME JURISDICTIONS, AND SOME OR ALL OF THESE EXCLUSIONS MAY THEREFORE NOT APPLY. TERMINATION. This License also shall extend to the Software and any updates or new releases thereof obtained by the Licensee, if any, subject to any changes to this License made by AAS from time to time and provided to the Licensee, provided AAS is under a separate obligation to provide to Licensee such updates or upgrades and Licensee continues to have a valid license which is in effect at the time of receipt of each such update or new release. This License shall remain in effect until terminated. The Licensee may terminate this Agreement at any time, upon notification to AAS. This Agreement will terminate immediately without notice from AAS if the Licensee fails to comply with any provision of this License. Any such termination by AAS shall be in addition to and without prejudice to such rights and remedies as may be available, including injunction and other equitable remedies. Upon receipt of notice of termination from AAS, the Licensee must (a) immediately cease to use the Software; (b) destroy all copies of the Software, as well as copies of all documentation, specifications and magnetic media relating thereto in Licensee’s possession or control; and (c) return all original versions of the Software and associated documentation. The provisions of Sections 1, 3, and 5 shall survive the termination of this Agreement. GOVERNING LAW. This Agreement shall be governed by and construed in accordance with the laws of the Province of Quebec, without regard to the United Nations Convention On Contracts for the International Sale of Goods and conflict of laws provisions, if applicable, and the parties hereby irrevocably attorn to the jurisdiction of the courts of that province. Les parties sont d’accord à ce que cette convention soit rédigée en langue anglaise. The parties have agreed that this agreement be drafted in the English language. SEVERABILITY. If any of the above provisions are held to be illegal, invalid or unenforceable, such provision shall be severed from this Agreement and this Agreement shall not be rendered inoperative but the remaining provisions shall continue in full force and effect. ENTIRE AGREEMENT. This Agreement is the entire agreement between AAS and the Licensee relating to the Software and: (i) supersedes all prior or contemporaneous oral or written communications, proposals and representations with respect to its subject matter; and (ii) prevails over any conflicting or additional terms of any quote, order, acknowledgement, or similar communication between the parties during the term of this Agreement except as otherwise expressly agreed by the parties. No modification to the Agreement will be binding, unless in writing and signed by a duly authorized representative of each party. NON-WAIVER. No delay or failure to take any action or exercise any rights under this Agreement shall constitute a waiver or consent unless expressly waived or consented to in writing by a duly authorized representative of AAS. A waiver of any event does not apply to any other event, even if in relation to the same subject-matter.